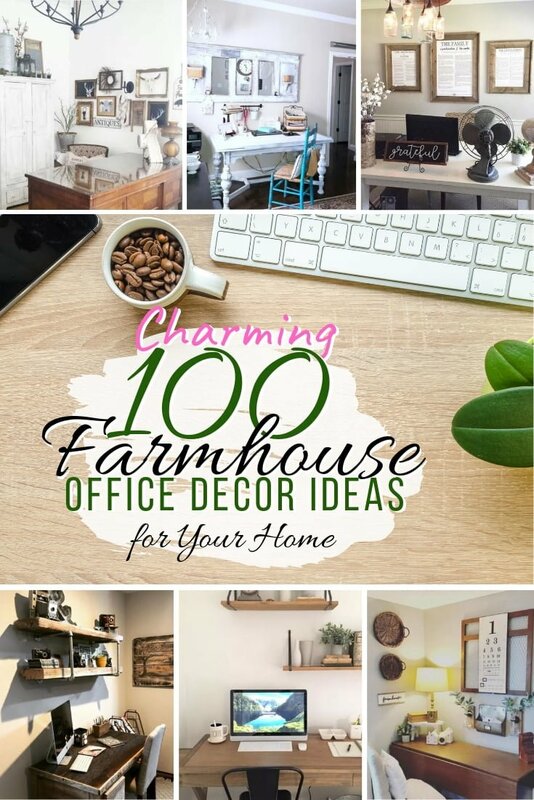 Looking for farmhouse office style decor ideas for your home. 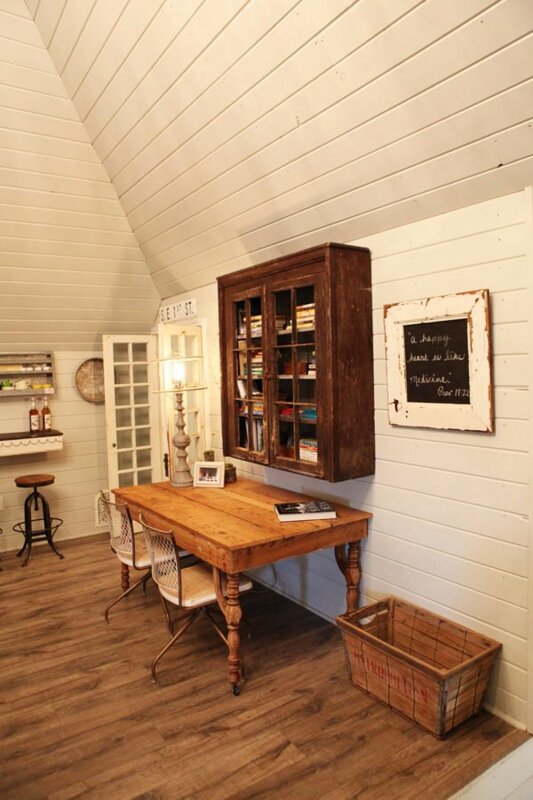 Here are 100 charming farmhouse home offices for your inspiration. 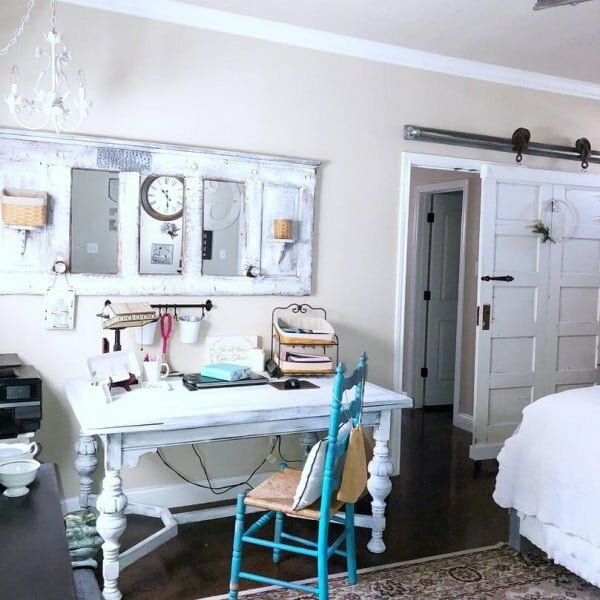 You don’t have to live in the country to embrace the comfort and cozy appeal of farmhouse decor. 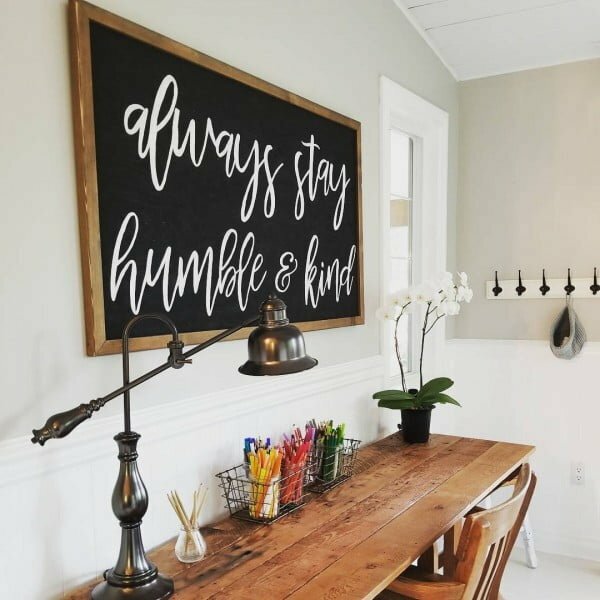 The farmhouse style has always had a place in the world of home decorating but has definitely seen a rise in popularity of late. Not only does it praise elements of nature, but also heralds back to a simpler time. From vintage window frames and wreaths to weathered wood and gingham fabrics, the farmhouse look can be achieved easily by adding a few simple pieces and items. 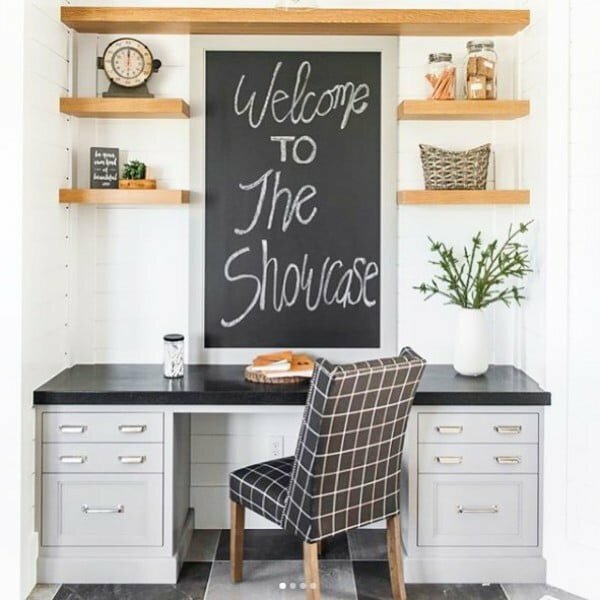 If you have introduced the farmhouse feel into your home and are wanting it to flow into other rooms of the house (such as a farmhouse living room), consider bringing the spirit of warmth and whimsy to your farmhouse home office with these ideas. 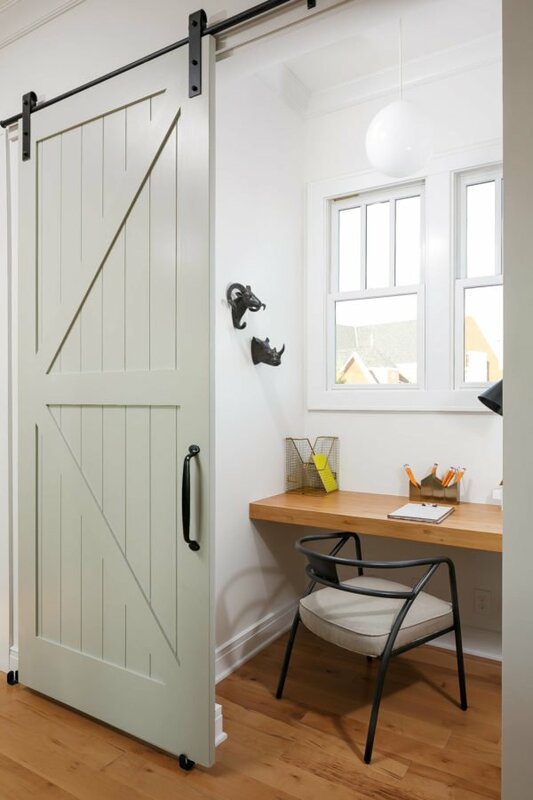 Few things scream ‘farmhouse’ like the sliding barn door and accompanying hardware. 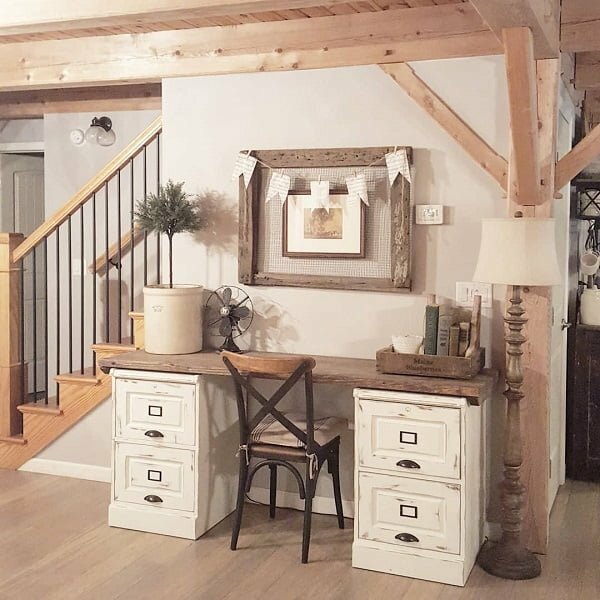 Not only is this a practical way of delineating a space, but it also is a unique and fun way to breathe in the farmhouse spirit. Who needs a traditional streamlined desk when you can enjoy the warmth and character of a work surface constructed from reclaimed wood. 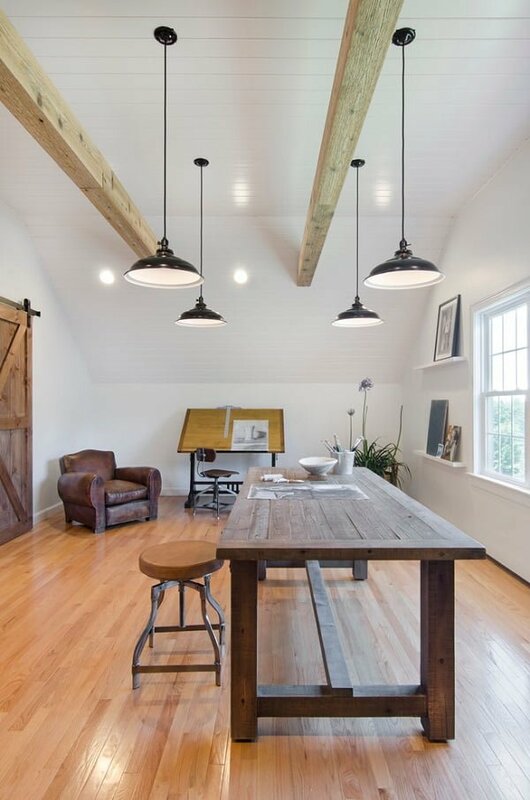 Using reclaimed wood is not only an eco-friendly option but also brings images of weathered farmhouse barns to mind. 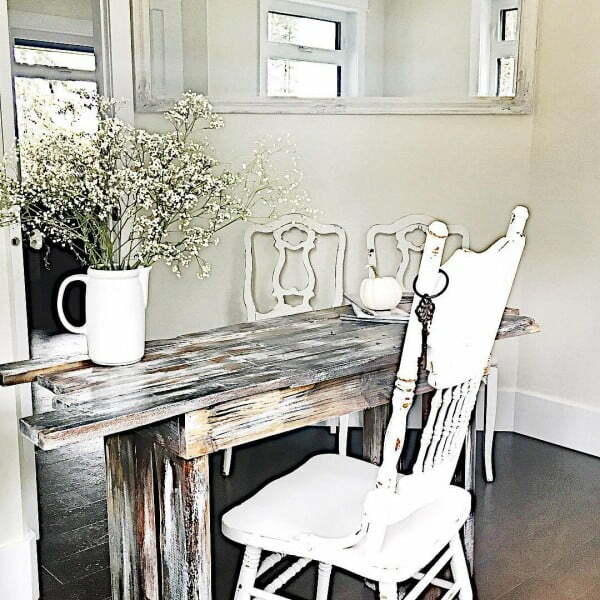 Pairings of cool white colors with warm wood tones is a fabulous way of creating that characteristic farmhouse depth in a space. The world of farmhouse lighting is as whimsical as it is surprising. 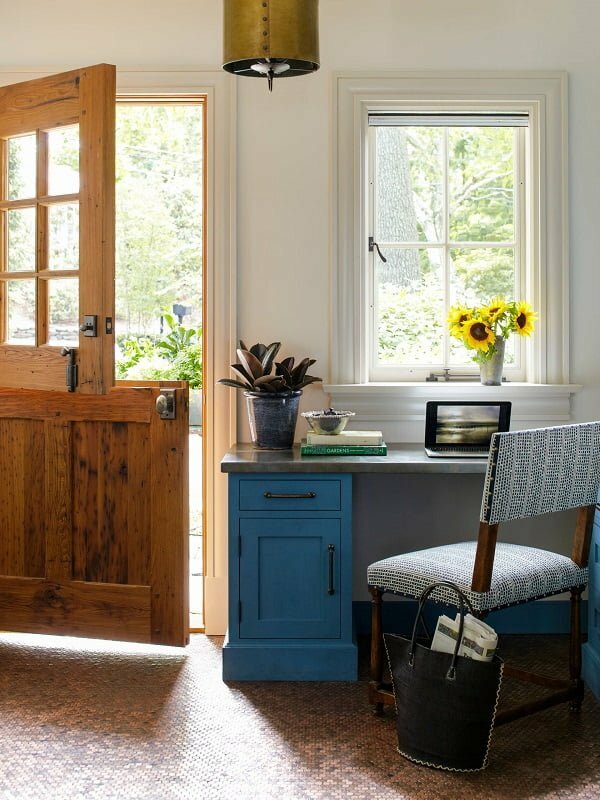 Borrowing from the functionality of the farmhouse spirit where all items are reused and reinvented in interesting ways, a washtub turned light fixture is the brightest of ideas. Gallery walls have never been more popular. 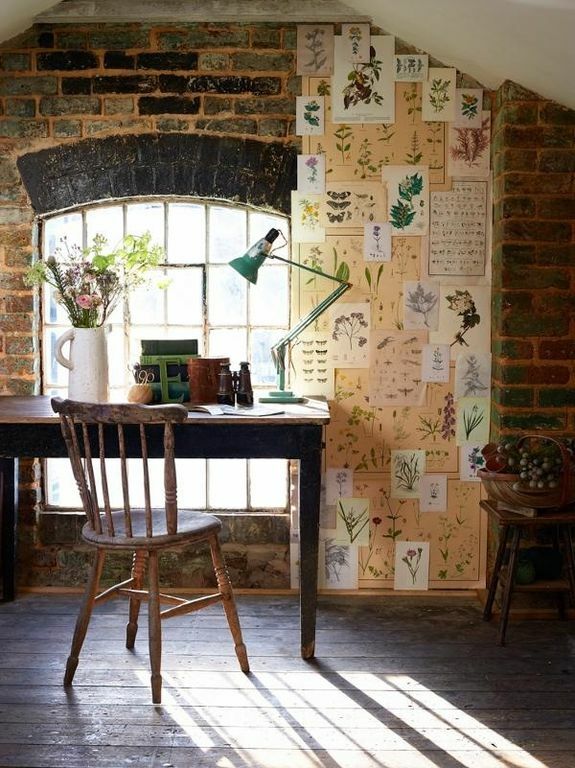 A collection of farmhouse-inspired images and items grouped together make a big impact on a feature wall. 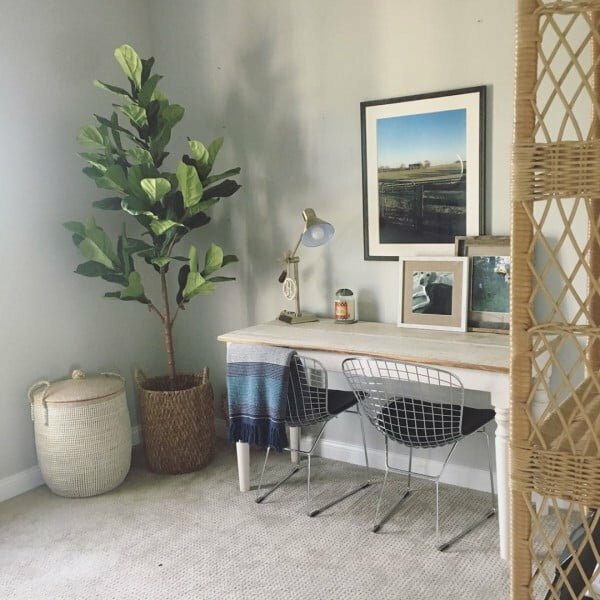 There are few items more quintessentially farmhouse than chicken wire. Even introducing a single element of this is enough to deliver the farmhouse vibe. 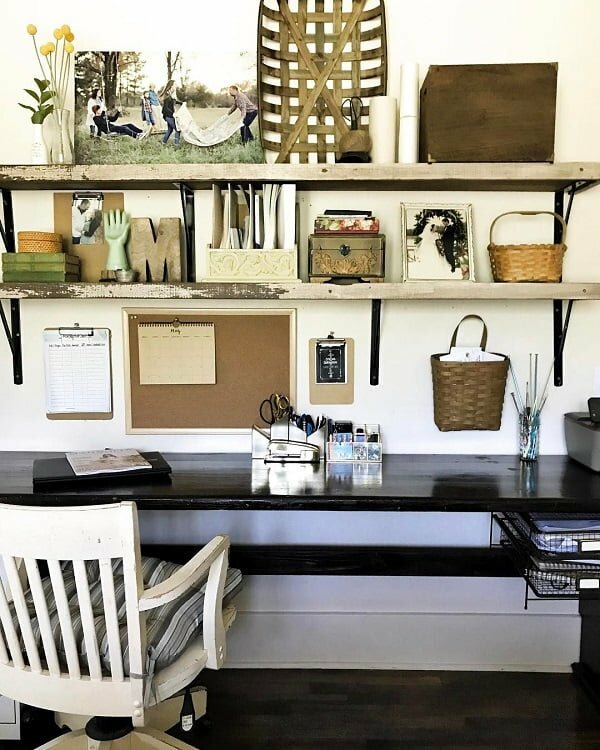 Open shelving displaying a few farmhouse-style items above a desk is both aesthetically pleasing and practical, as they provide additional space for items, helping to keep the workspace clear. 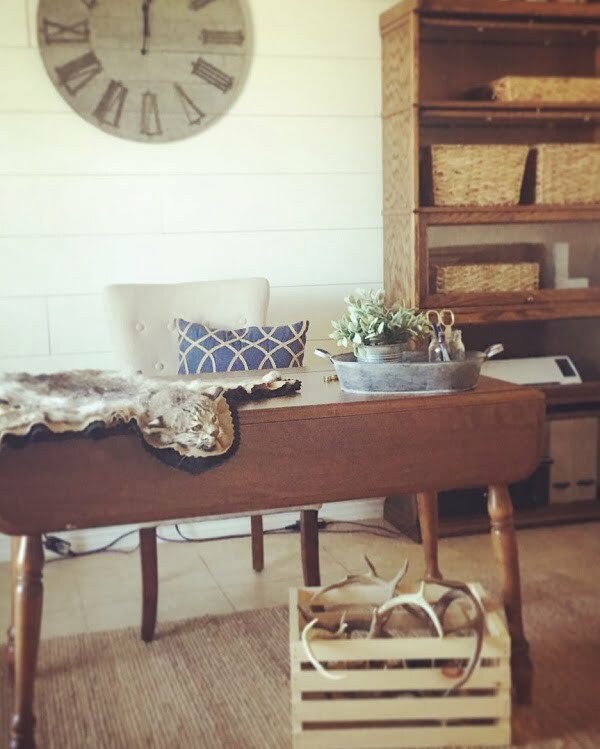 Pallet artwork is great in a farmhouse space as it speaks to the style’s rustic nature. 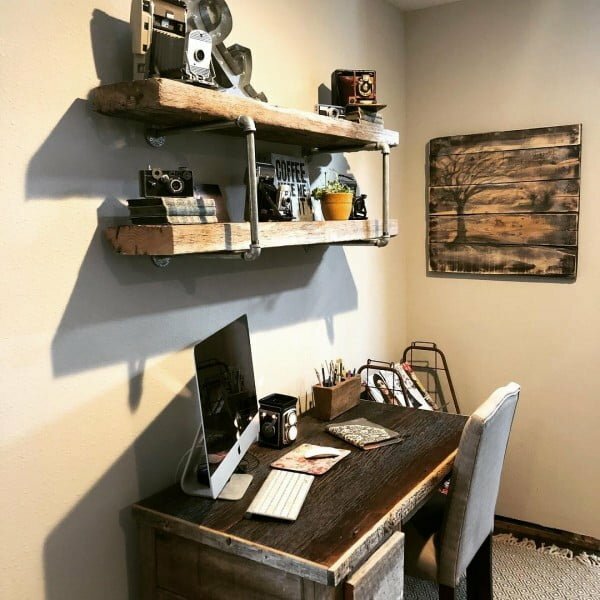 Adding shelf brackets made from industrial materials is the ideal way to channel the ‘industrial farmhouse’ spirit. Adding whitewashed wood planks to a wall instantly transforms it into a feature wall bringing with it texture, depth, and character. 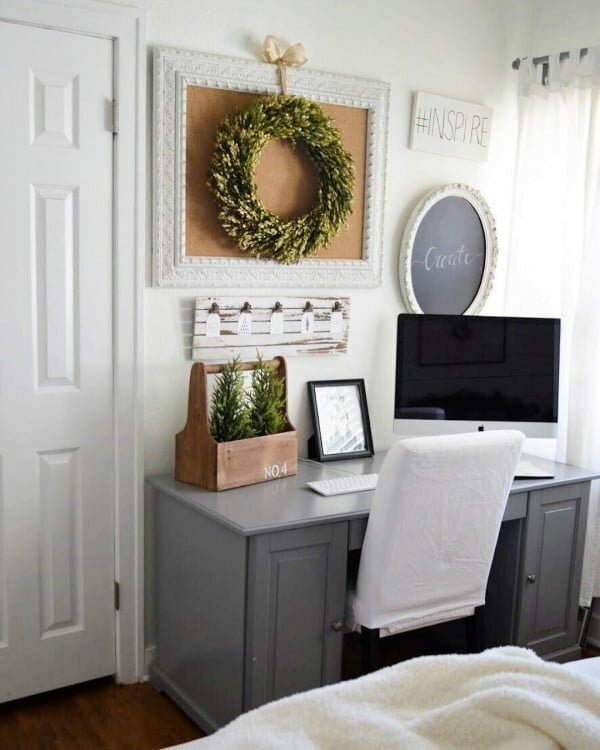 You would be hard pressed to find a farmhouse without a welcoming wreath on its door, so adding one to your home office introduces a touch of that infamous farmhouse hospitality. Large roman-numeral wall clocks add a visual pop in a space and can hold an entire wall all on their own. 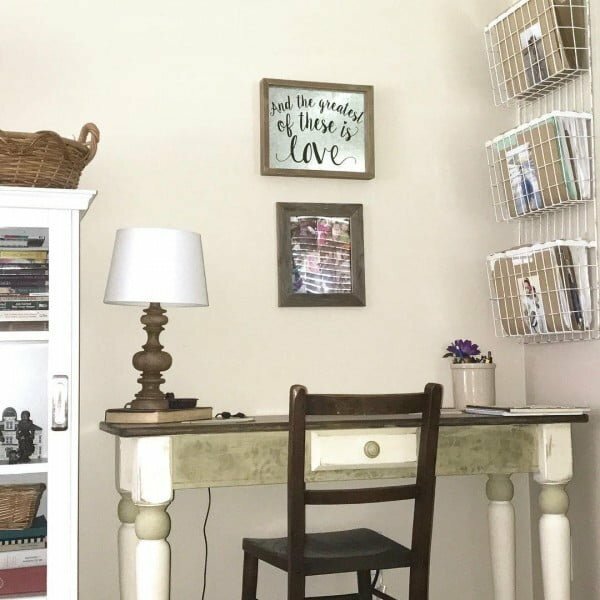 If you can live without a fancy ergonomic swivel office chair, using a wooden chair with spindles is the perfect way to add a splash of farmhouse charm. 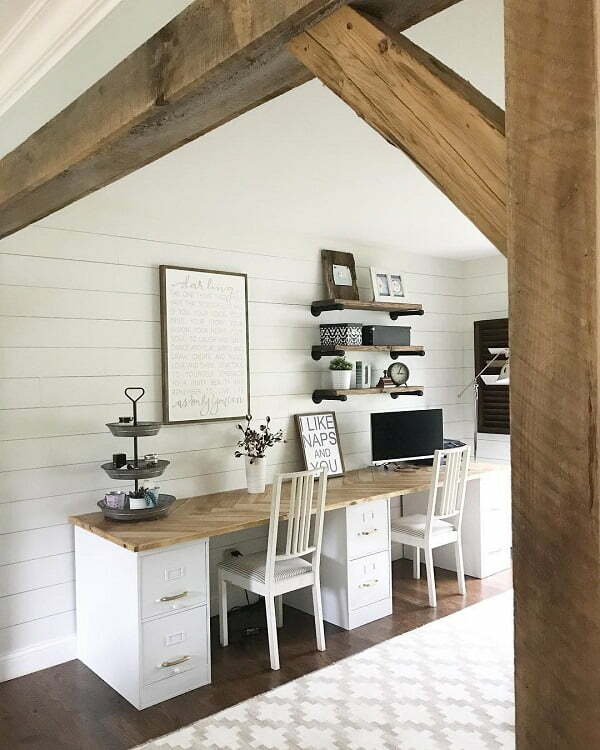 Really, who doesn’t love shiplap? 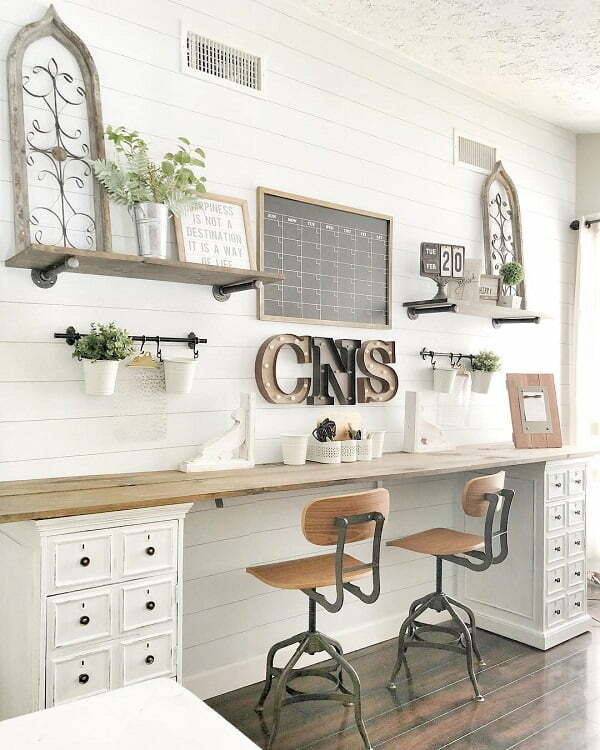 Adding it to office walls screams country, while pairing it with a couple modern pieces provides a crisp balance. 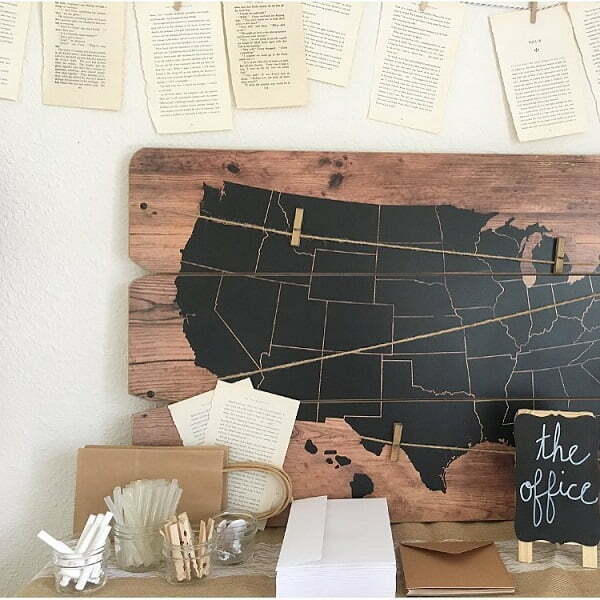 Creating an organizer/display out of clothespins invokes images of clothes blowing in the wind on country clotheslines, adding just the right amount of rustic country charm. 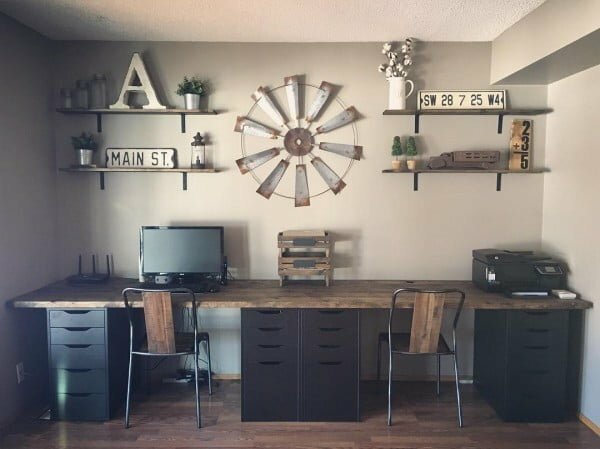 Adding items, like windmills, into an office’s wall artwork is the perfect example of farmhouse versatility and could not be more unique. Adding a sign into a space provides the perfect graphic punch, while conveying a message of value to inhabitants and guests. 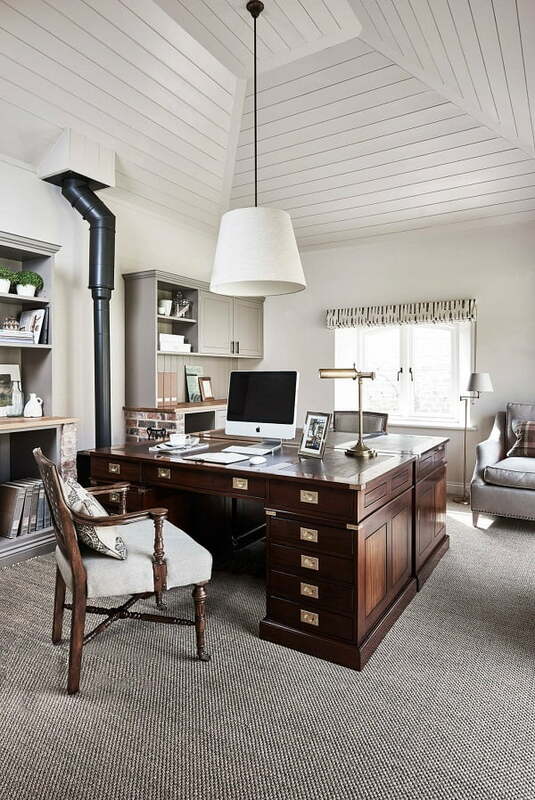 Few things seem better suited for a home office than a large-scale map, and one done in neutral earthy tones mimics the farmhouse neutrality enjoyed by so many. 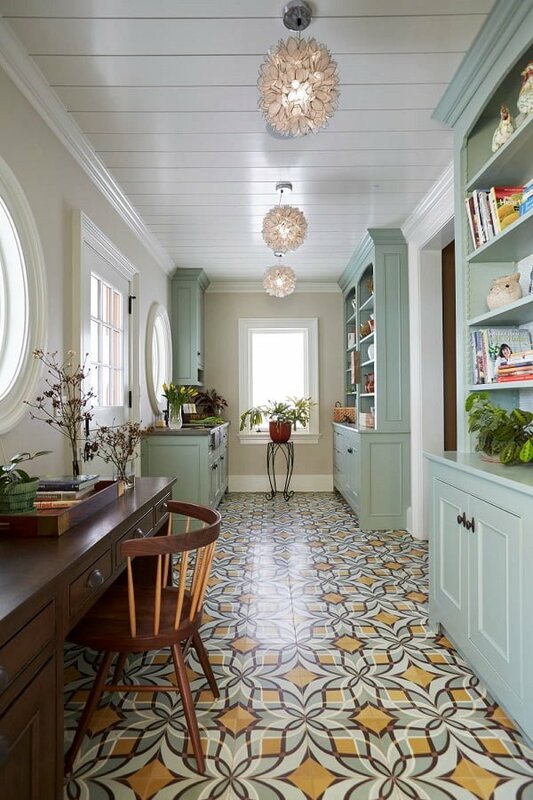 What is so appealing about the farmhouse style is that it can sometimes be achieved so simply. 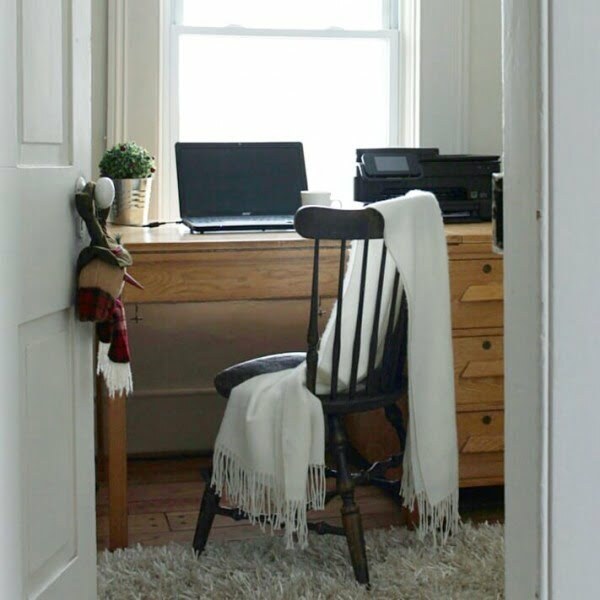 Adding a throw to your workspace instantly warms it up and beckons that warm and cosy spirit. 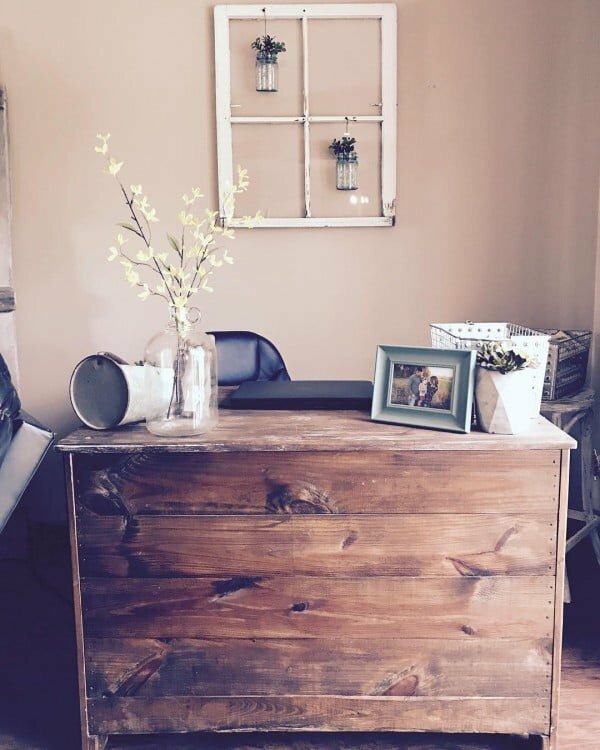 There are so many cool alternatives to the traditional office desk out there. 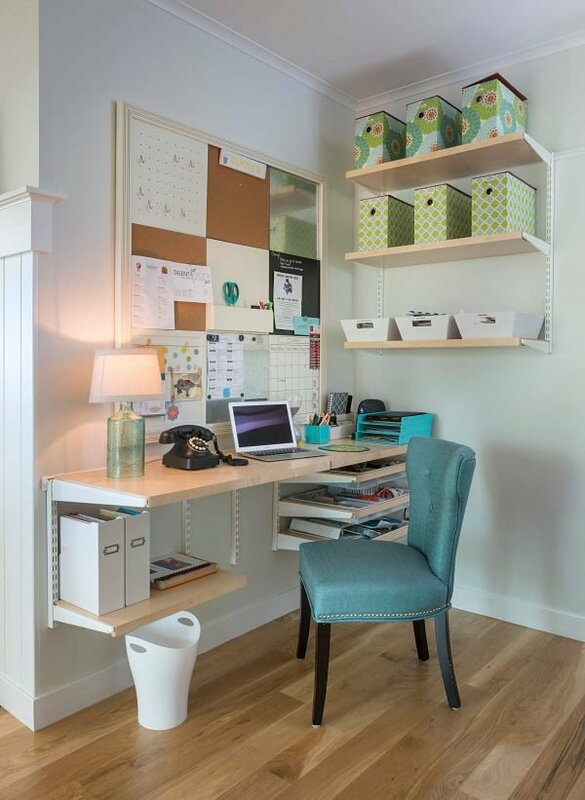 Repurposing filing cabinets as desk supports offers the perfect union of form and function with loads of added storage and organization potential. 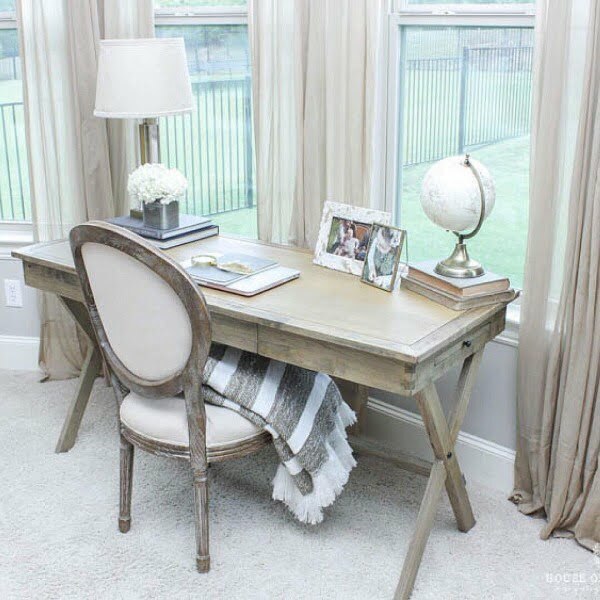 As the desk is the heart of a home office, using an old farmhouse table as the work surface instantly transports the space into the farmhouse dimension. 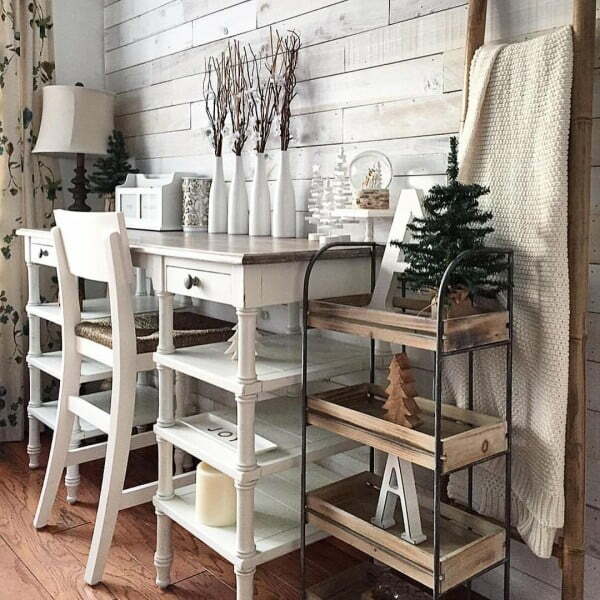 Using reclaimed wood for shelving is a cost-effective way of bringing in the treasured touches of simplicity and charm. Adding a splash of gingham or plaid fabric in a space provides the perfect farmhouse textile touch, as is so often seen in country farmhouse kitchens. Adding a galvanized container or two packs a powerful punch when it comes to the farmhouse spirit of practicality and function. 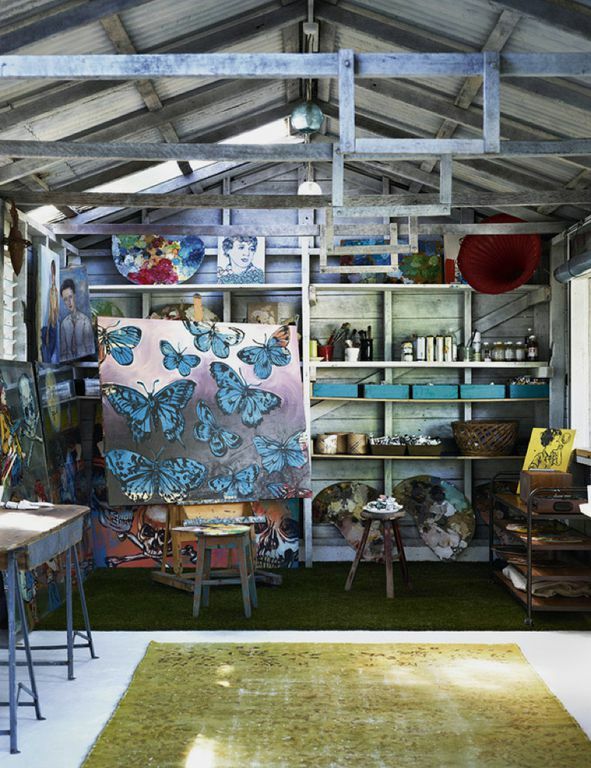 Consider using a galvanized container in your home office as a refuge container. 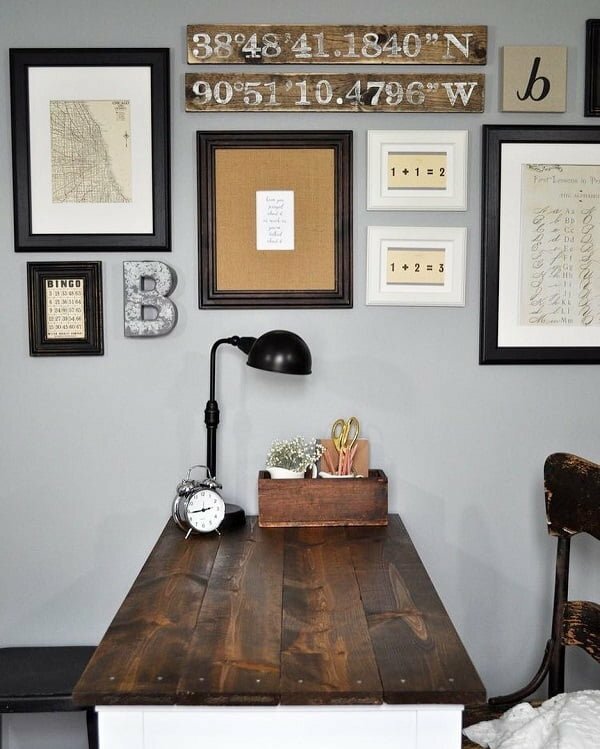 Weathered wood pieces, from desks to frames, add unparalleled pops of character, warmth, and homespun appeal. They provoke viewers to wonder where they were found and what stories they could tell. 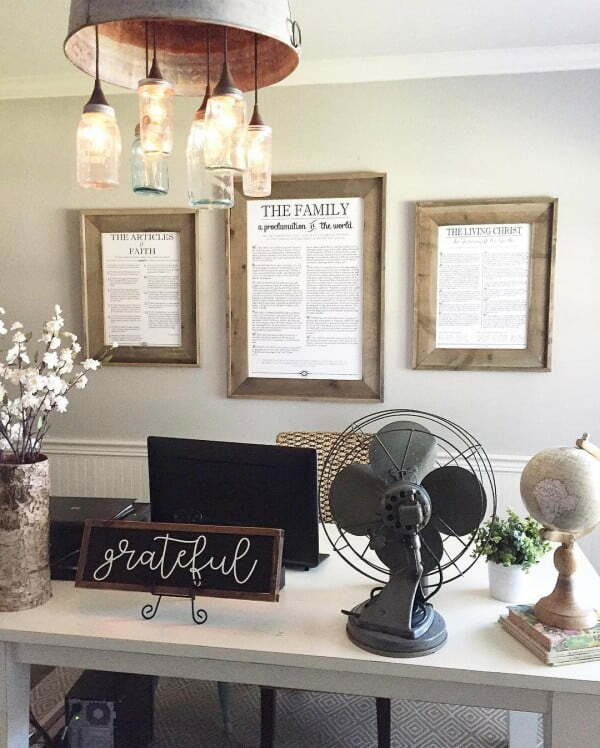 A framed farm image above a desk makes it a main feature in the home office, communicating the peaceful calming feel of the space. 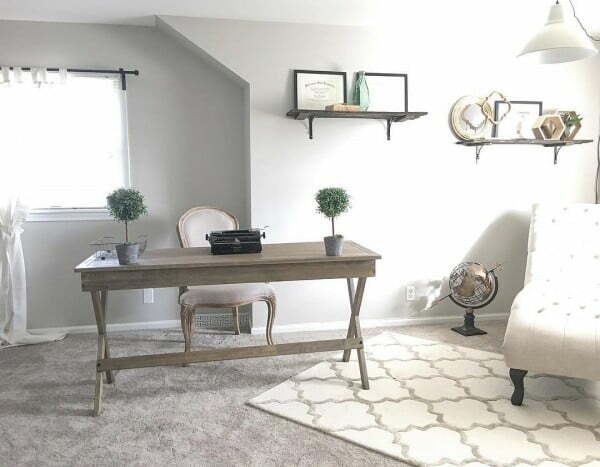 Farmhouses are known for their monochromatic to neutral color palettes, so cool neutral greys paired with whites and other earthy tones are the perfect choice for any farmhouse home office. 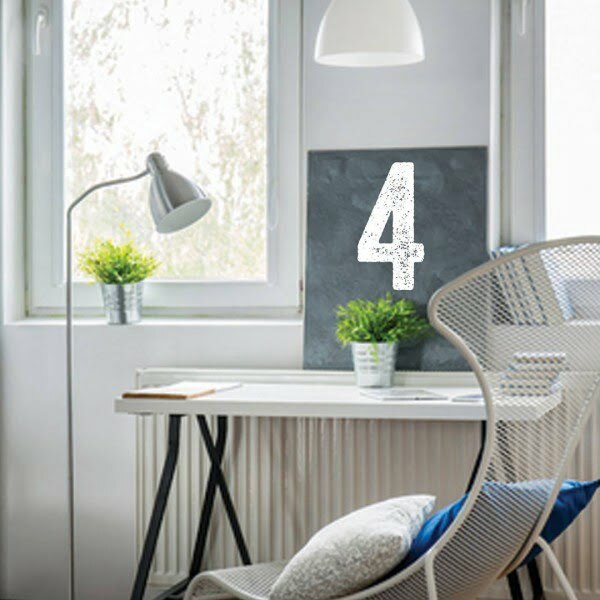 Using numerals in your home office, either organizationally or as artwork, is a great way to add a touch of whimsy and frivolity to space. 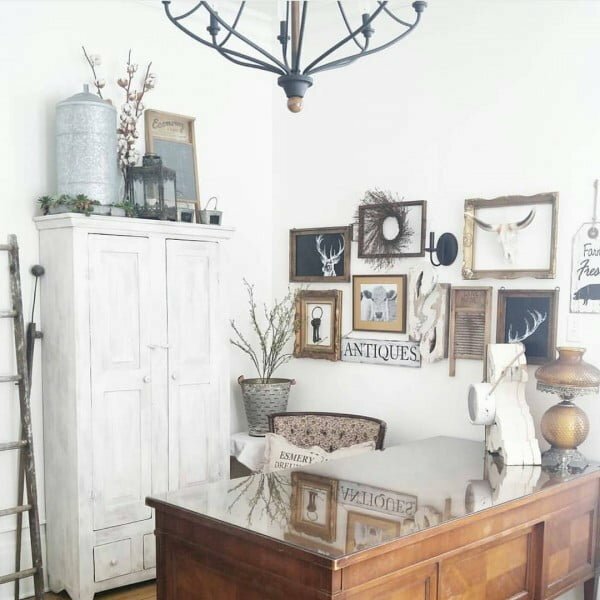 Adding a vintage window frame to your home office space, basically in any fashion, will instantly elevate it to the farmhouse level. 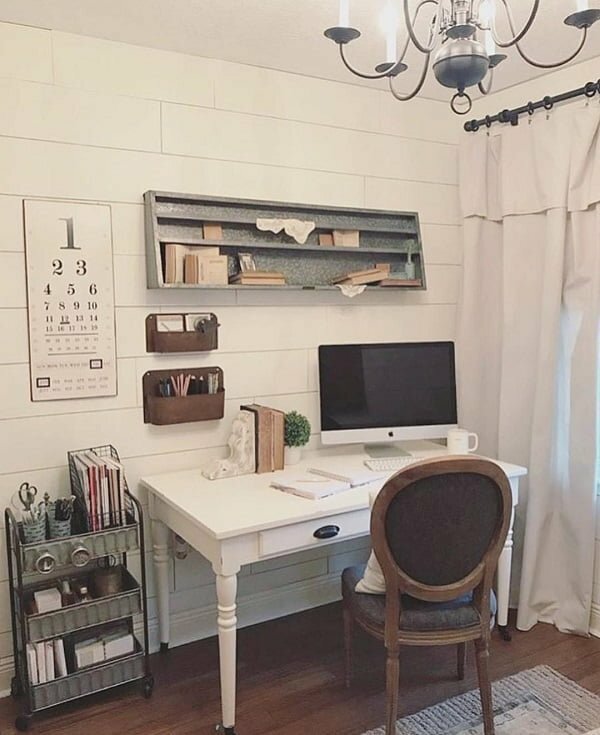 Adding a rustic brick wallpaper to a home office wall creates an instant focal point, visual interest, and farmhouse appeal. 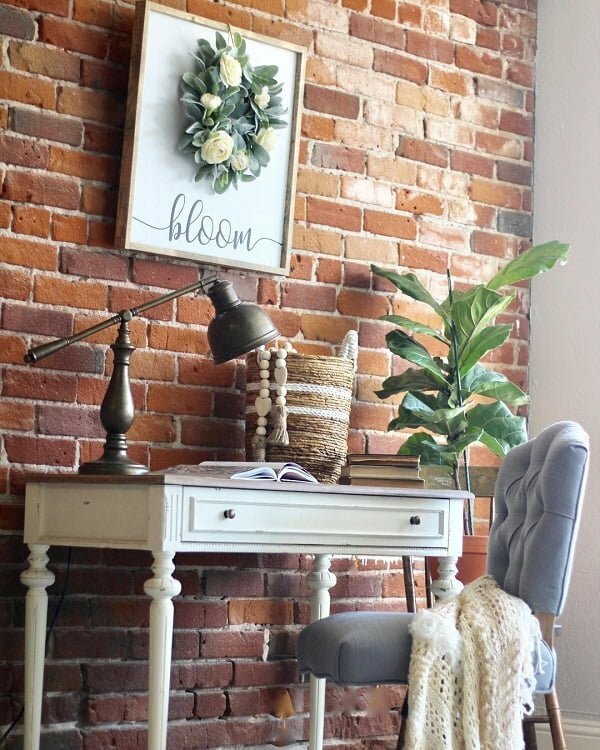 The textural look and feel of brick, even just as a print, brings in that layer and depth characteristic of the farmhouse style. 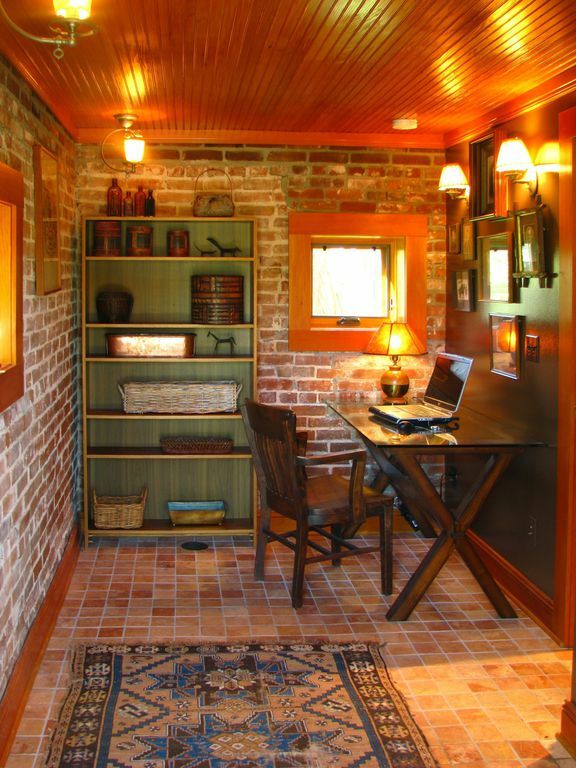 An unusual take on office space, decorated with red brick walls, tile flooring, and a detached office desk to create a dose of privacy. 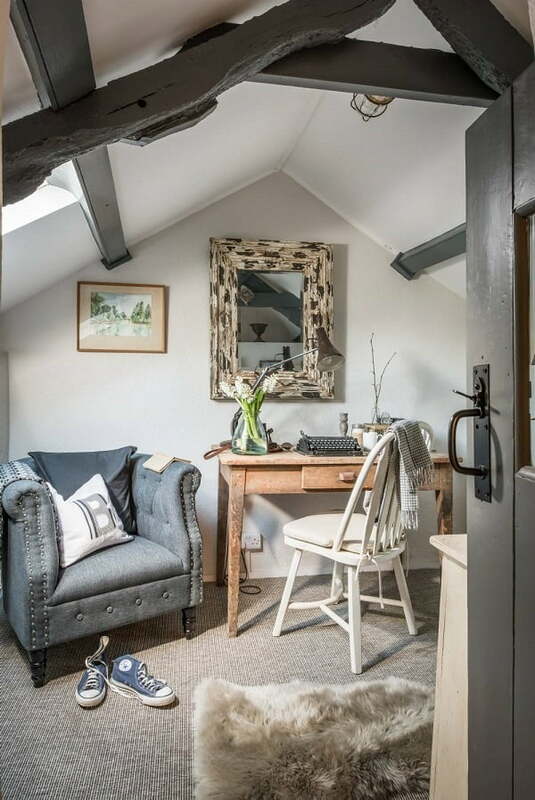 The attic office space focuses on the statement vintage window, englihting the rustic wood desk and romantic collage wall perfectly! 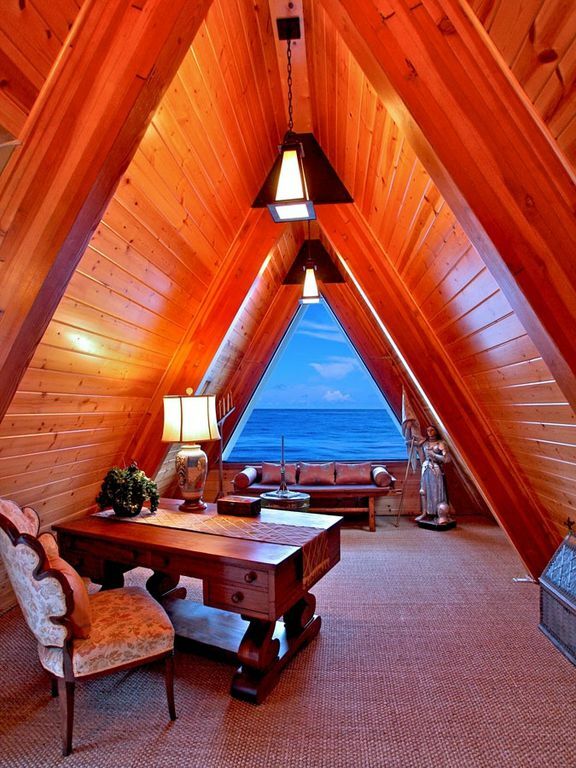 Take wood attic floors, luxurious office armchair, and triangle outside window overlooking the ocean, and you have yourself a majestic office decor idea! 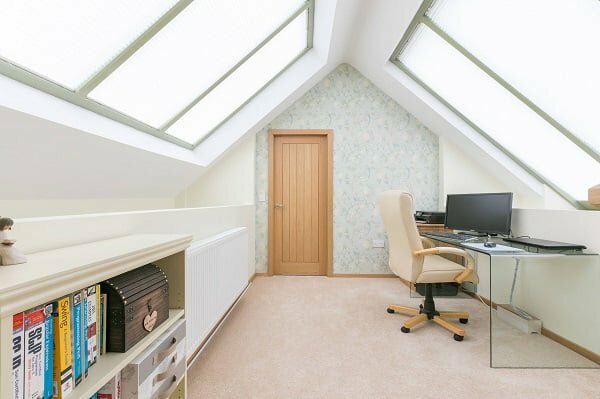 This attic office creates a warm space through the warm wood walls and ceiling, as well as the light-introducing whole window. 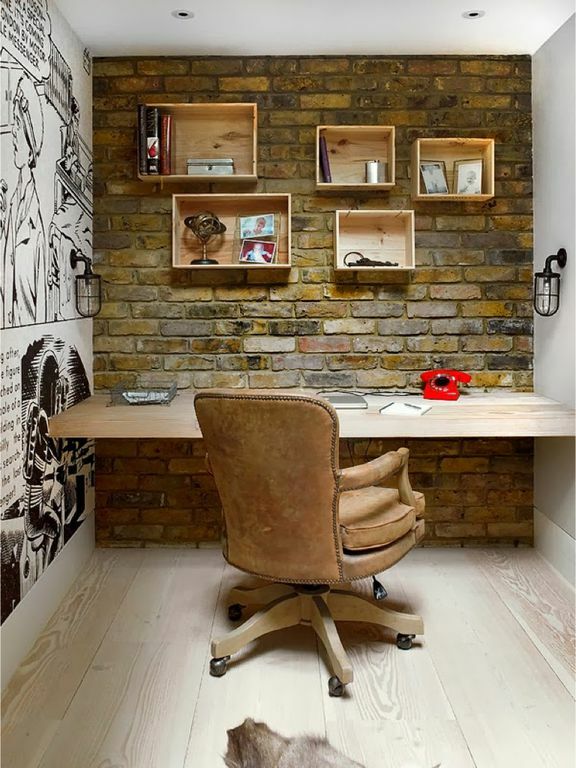 An exquisite blend of colors, from the greenish brick wall to the comic book-inspired side wall and the shelf-like office desk. 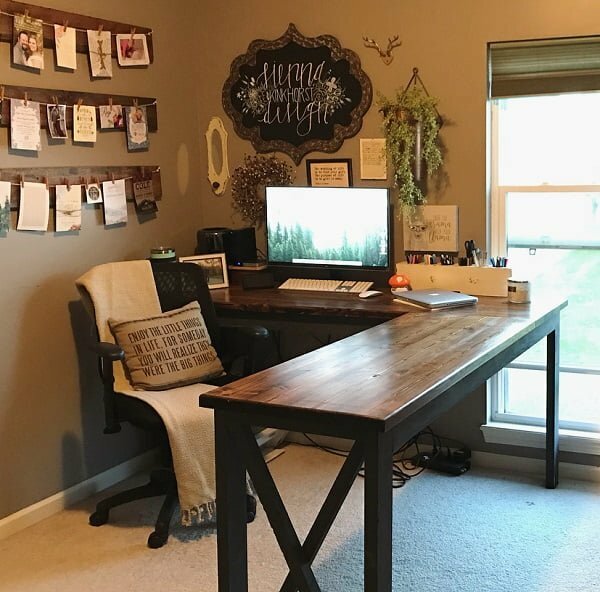 Take a look at this gorgeous blue-based office, majestically accentuates the rustic, built-in shelf rack and under-window school desks. This wood-wall office uses minimalistic chairs and half-patterned carpet to create a pleasant and cozy space to work in. This office relies on triple the light and focuses on the playful green chair and dining table-like office desk. A sight for sore eyes! 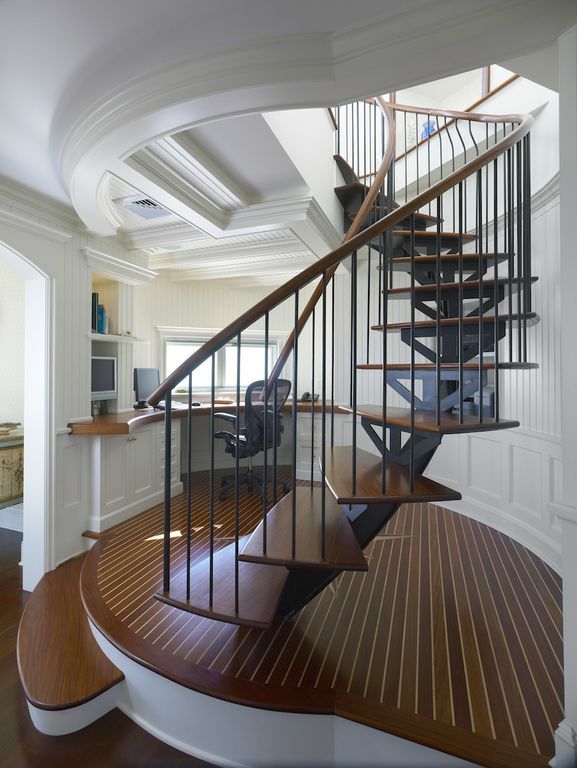 A marvelous home office design, centered at a bar-like area, with an elegant indoor staircase behind it, offering plenty of privacy! The formal black wood office desk and chair, steal the entire attention while allowing plenty of light in the room and yellow decorative bits as well. 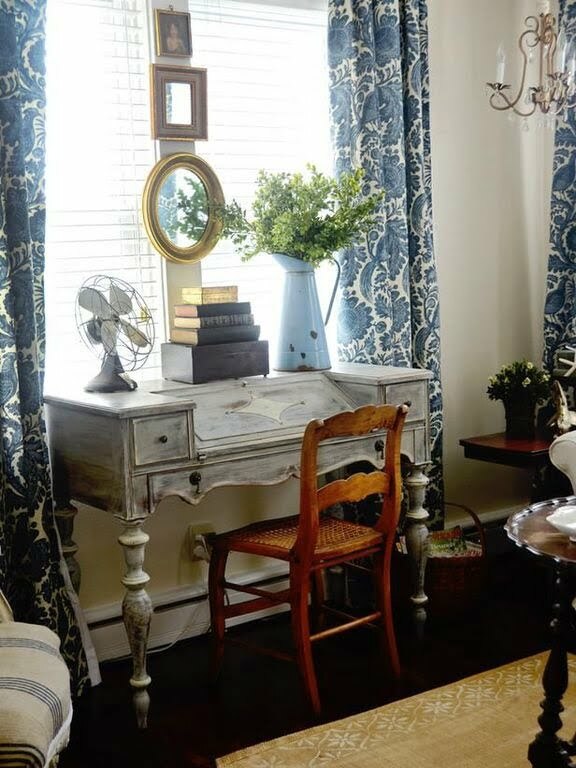 The vintage design of the office consists of a nightstand-inspired desk, blue-printed curtains and central mirror which reflects the light amazingly. This exceptional office creates space through the minimalistic and retro desk and the hippie patterned curtains, bursting specks of yellow across the room. Please your senses and have a look at this spectacular office, with baby blue chairs, minimal storage desk, and kitchen-like cabinets. The wood desk melts into a ceiling-high cabinet, while the inbuilt set of shelves perfectly complements the all-white walls. Sensational! 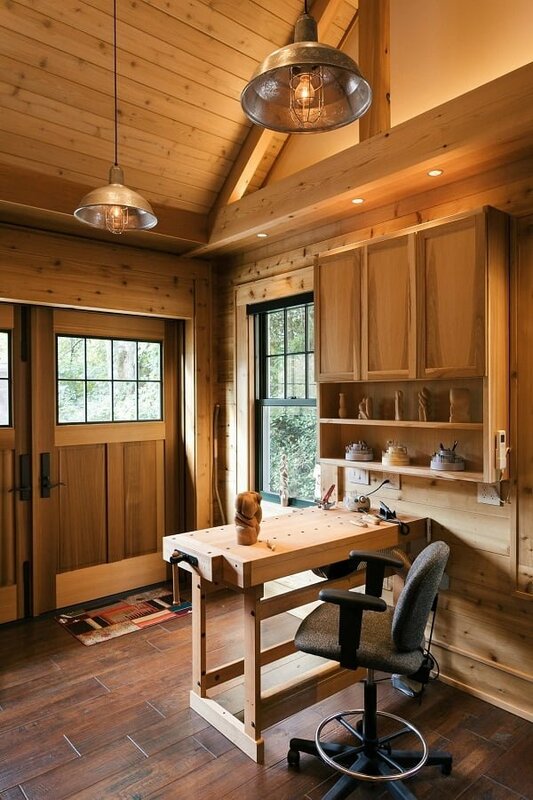 This garage office setting is built with tin walls, multiple enlighting windows, and a central hardwood dining-like desk. 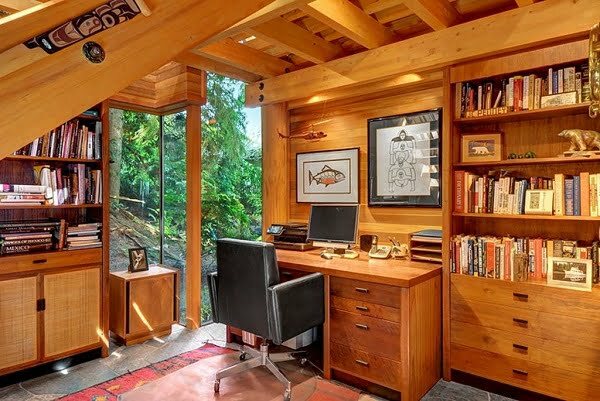 This fancy double-desk en suite office explodes with patterns and contrasts, from the massive wall shelf set to the cottage-inspired wood ceiling columns. 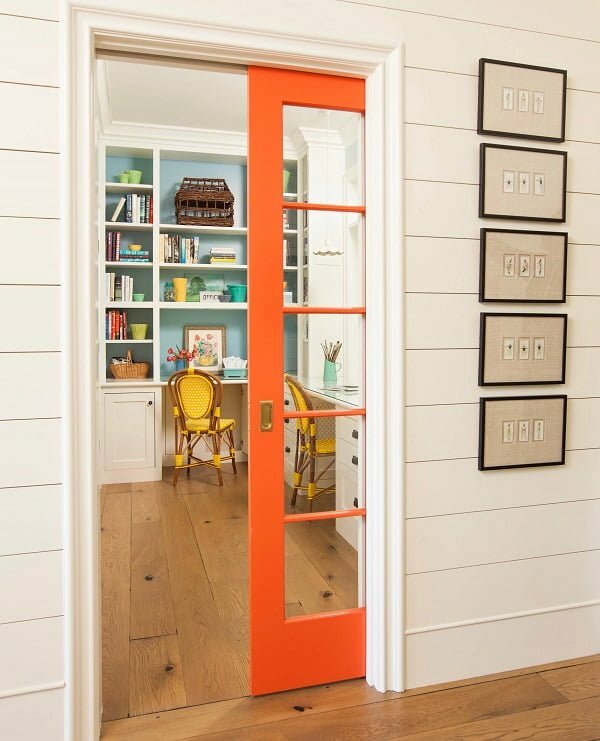 The office space combines orange sliding doors, pale blue walls and retro yellow chairs to create an almost 70s vibe. Making it work! The modern-day design is focused on all-white cabinets and walls, giving only the light wood floors the chance to pop. 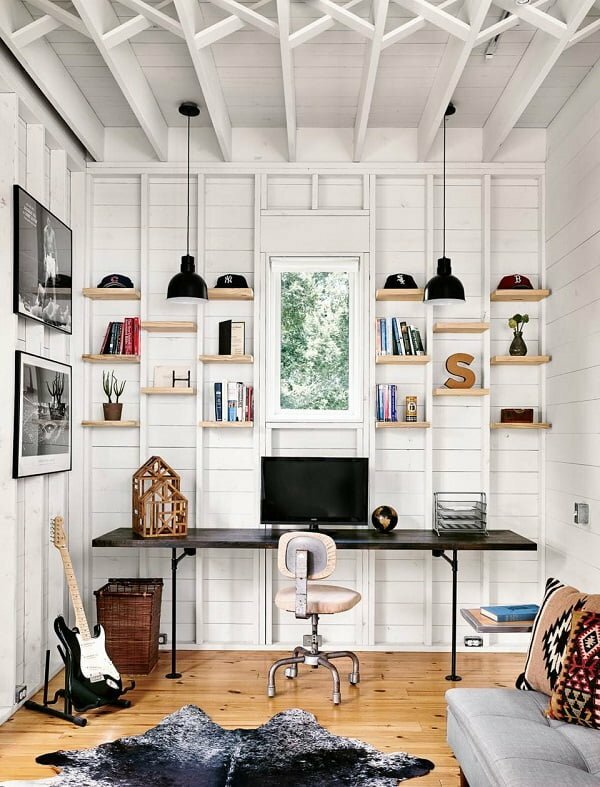 The helpful sliding barn door reveals a secluded and private office with shelf-like desk and modernistic office chair. Effective! 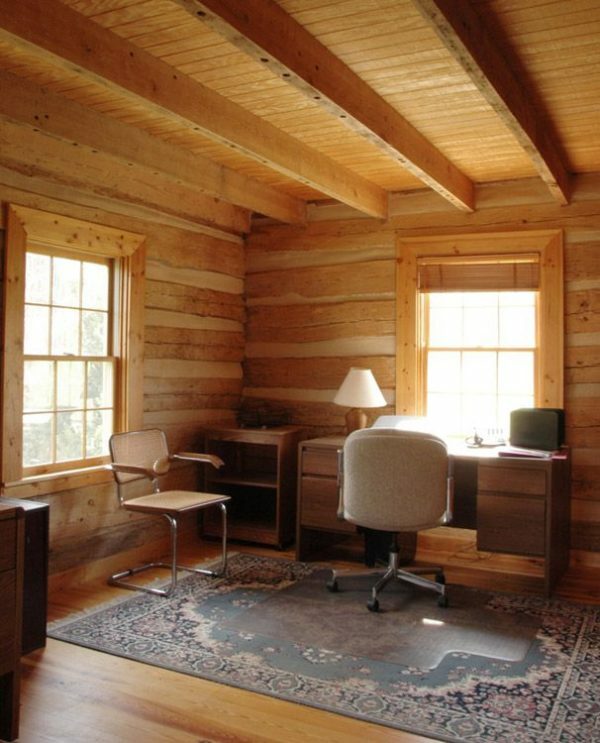 The business-like and professional office includes dark wood interior and sensational and thick office desk. A dreamy office which uses soft pink walls and luxurious burgundy chair set, which perfectly enhances the contrasting green chandelier. The captivating wall-to-wall book rack is the very core of the office, while the symmetric hallway and triple windows add thickness to the room itself. 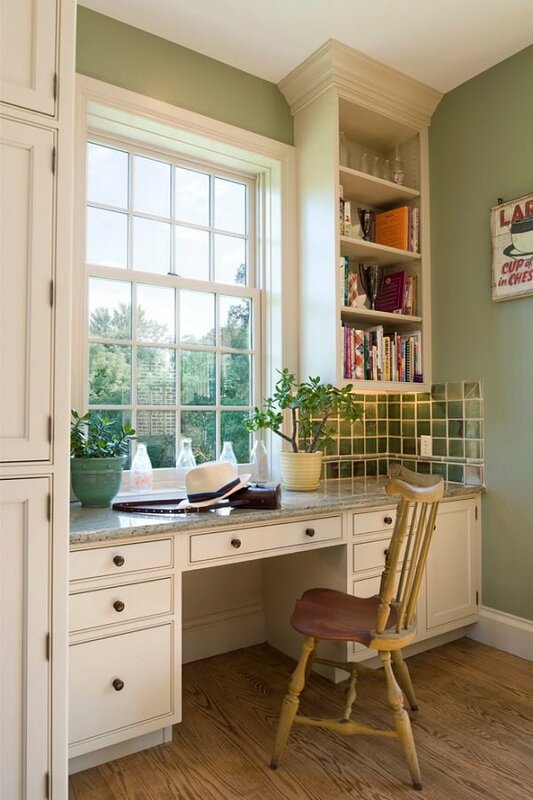 This office takes pieces of kitchen and cabin decor, effectively using green tile walls and a charming padded chair. The office incorporates many wonderful details, such as the en-suite kitchen and double wood wall desk. 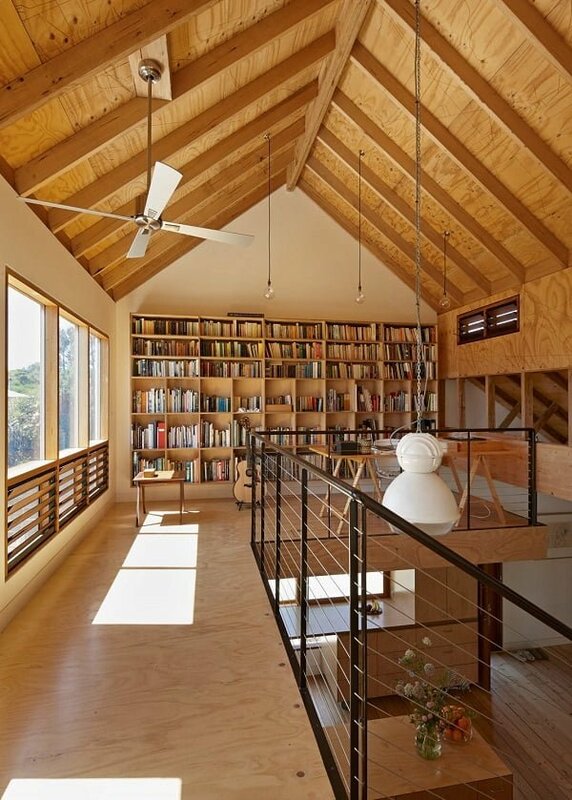 Finally, the hanging bookshelves are a knockout! 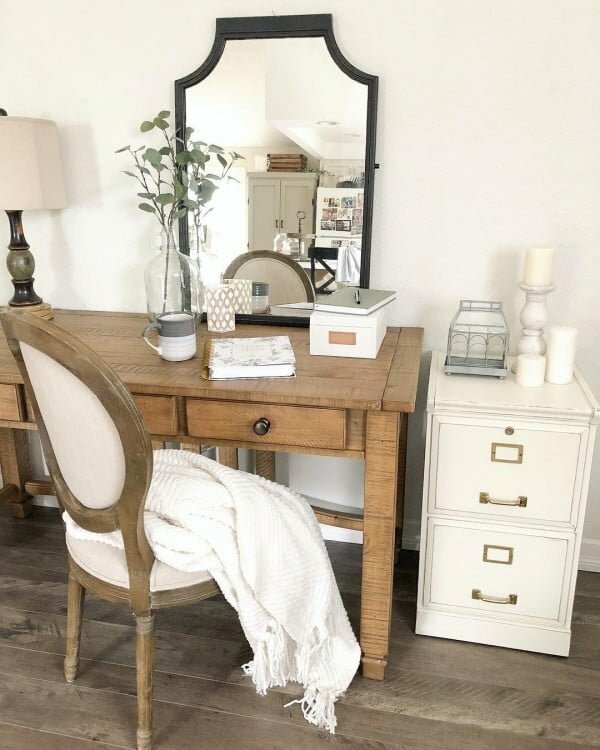 From the precious wood office desk and vintage typewriter to the statement mirror and cozy armchair, the office exudes tranquility and harmony! 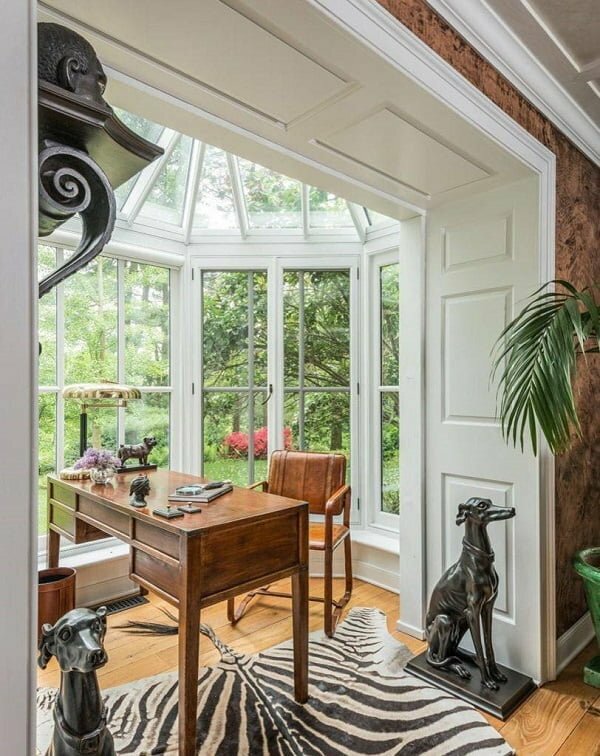 The all-window round wall reflects light across the office, accentuating the high self-standing desk and metal animalistic figures. Everything in this office, from the pink armchair, vast walls double windows to the tiny sitting set, screams creativity and uniqueness. Excellent! The Arabic tile floors add volume to this office, alongside the double bookshelf rack and a mix of square and round windows. 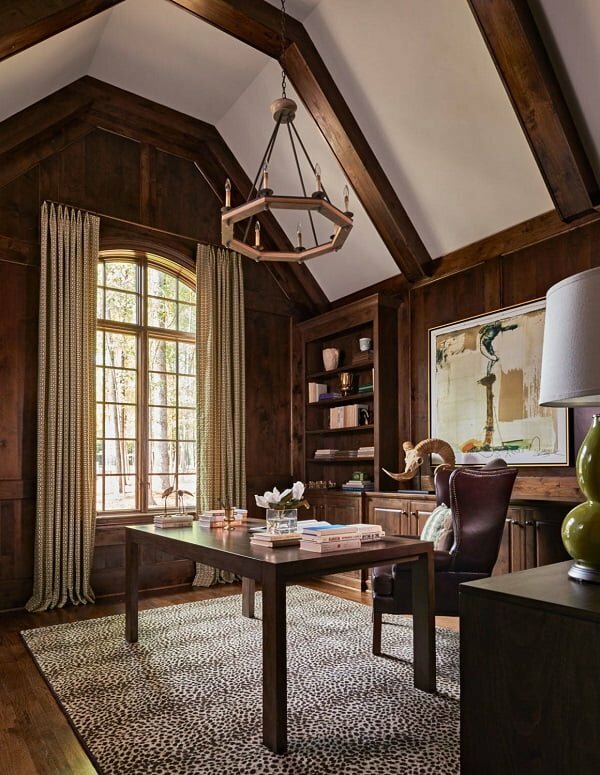 The entrance hallway-turned-office focuses on an impressive wooded desk and dramatic wood ceiling columns. Also, an excellent choice of a middle-age chandelier. 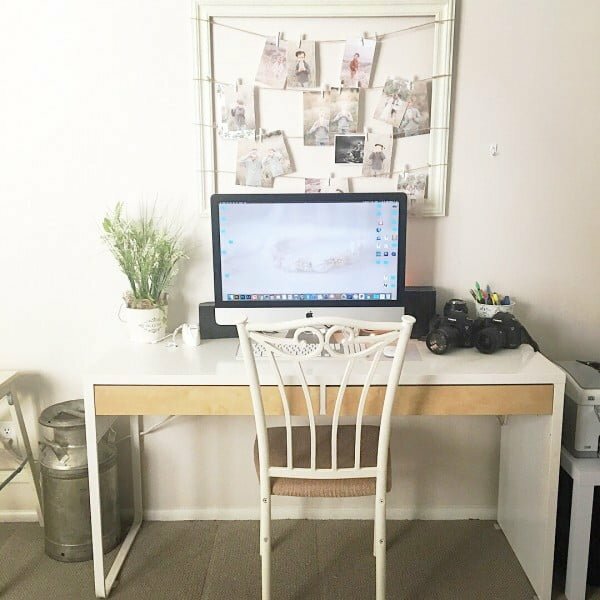 The cozy office has immediate access to the garden and uses plenty of decorative bits, such as the sky-blue desk and padded office chair. 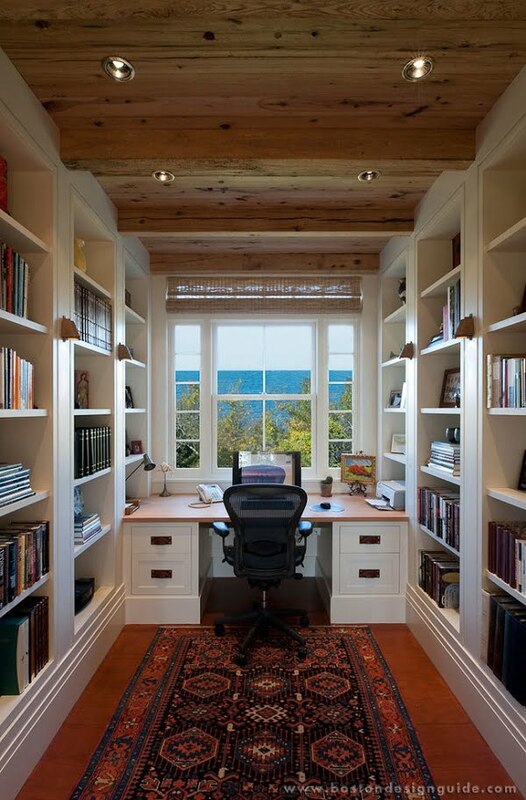 The massive wood office desk connects intelligently with the white wall bookshelves and emphasizes the grand and luminous window. 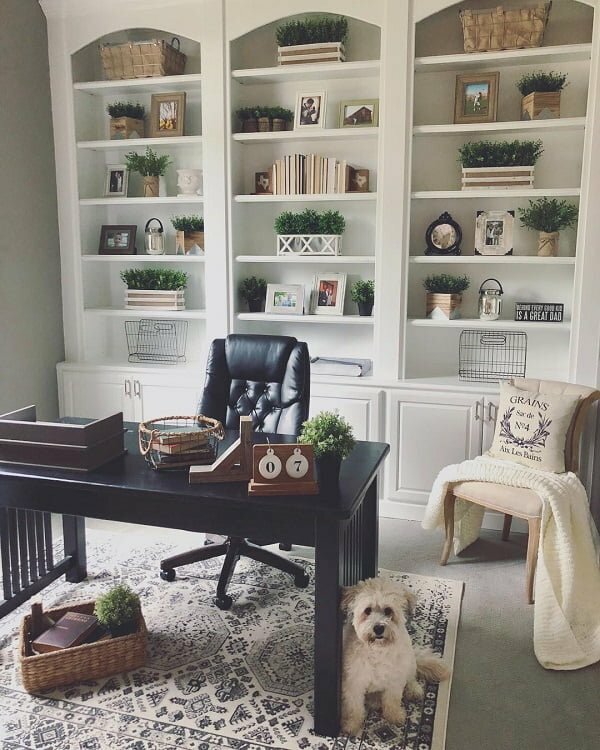 This office uses dark hardwood floors and wall-to-wall office desk and cabinets, making space explode with luxury and elegance. 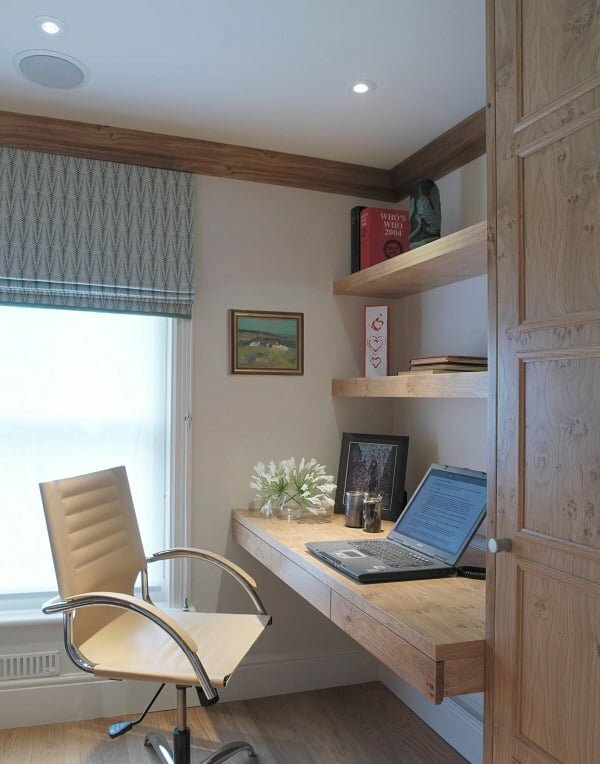 The in-built office desk is set against a dark hardwood wall and contrasts the white side cabinet set amazingly, while the two red wall lamps give the room a much-needed pop of color. 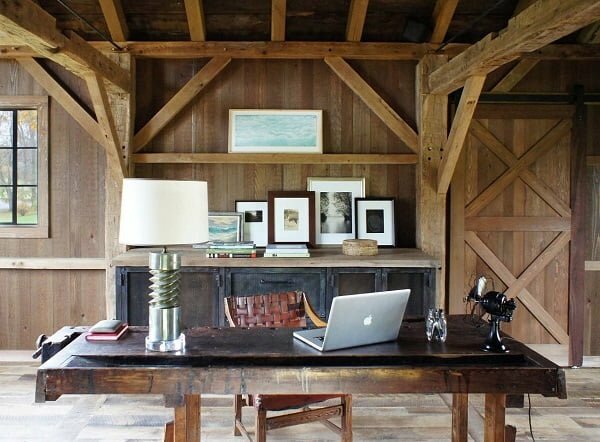 The office relies on a self-standing wood work desk and high ceilings, in order to encapture a comfortable and spacious barn-inspired office setting. 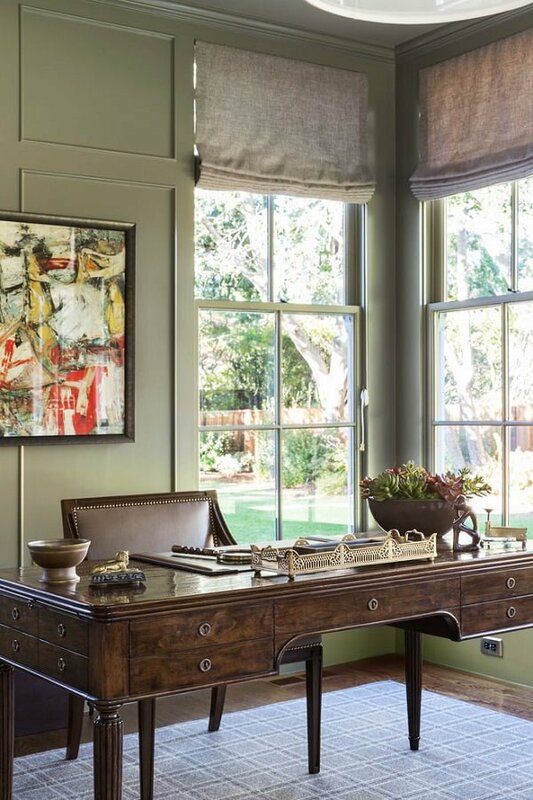 The office space works its elements well together, including the rustic hanging glass cabinet and double-chair set. 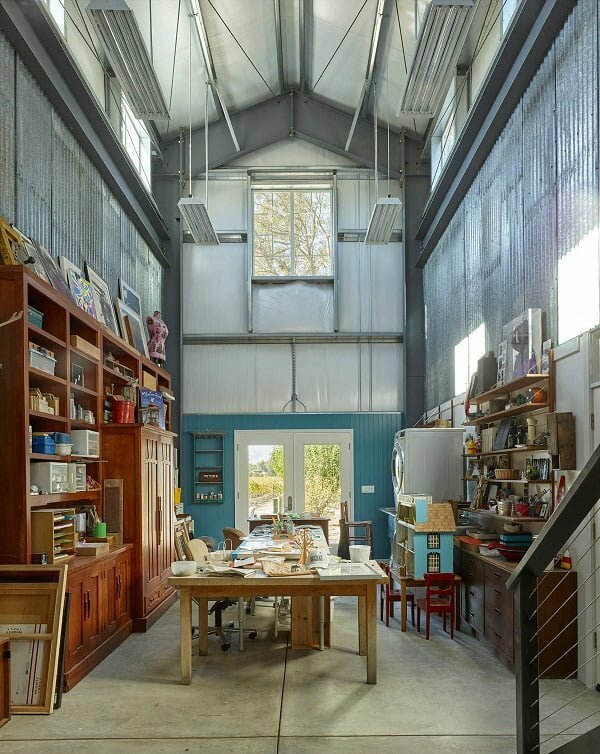 What grabs the attention the most is the startling high ceiling. 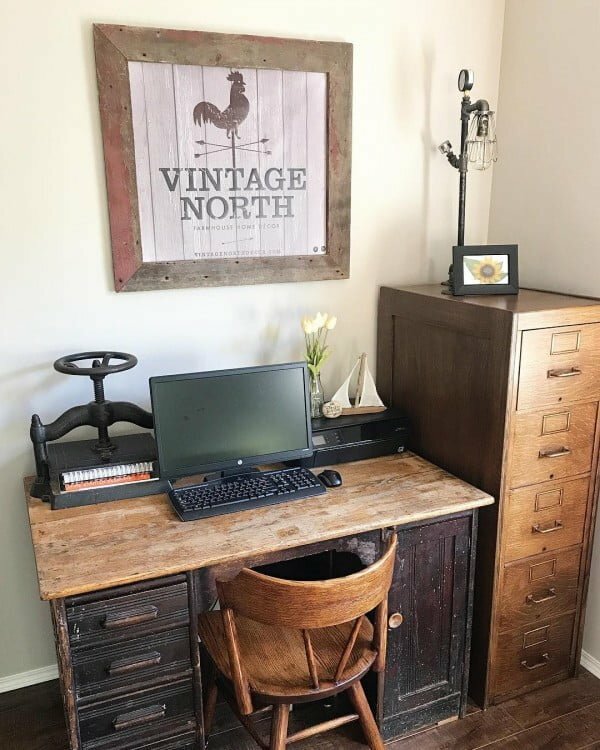 From the G-shaped hardwood desk to the vast and open outside window, this office uses smart and practical retro elements to provide both room and quality of design. 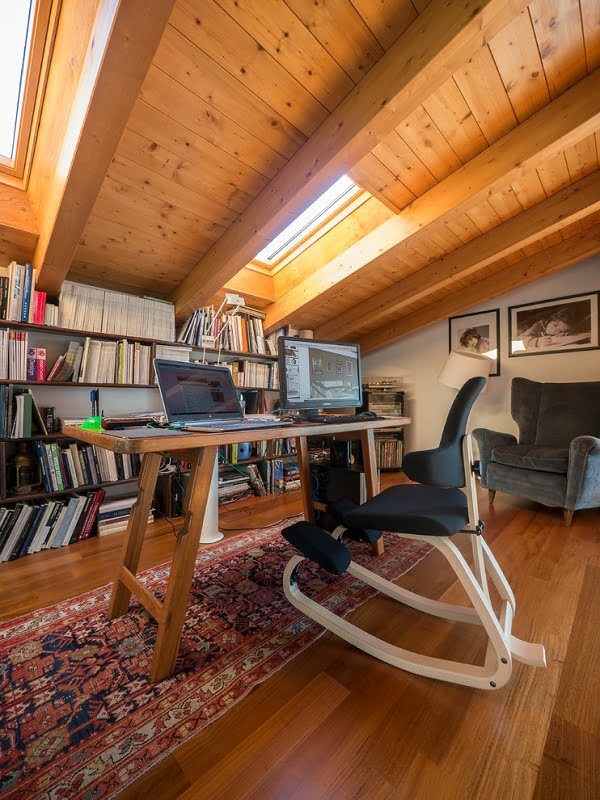 This office is wisely settled in the attic and uses medium wood ceiling, an oriental carpet, and built-in shelf rack. 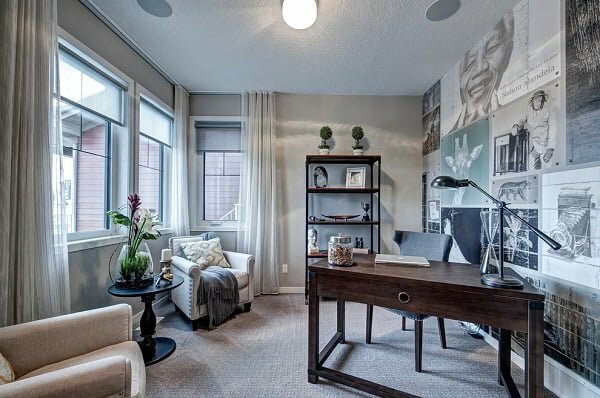 A great office space with a dark wood executive desk, colorful wall painting, and a corner set of spacious windows. 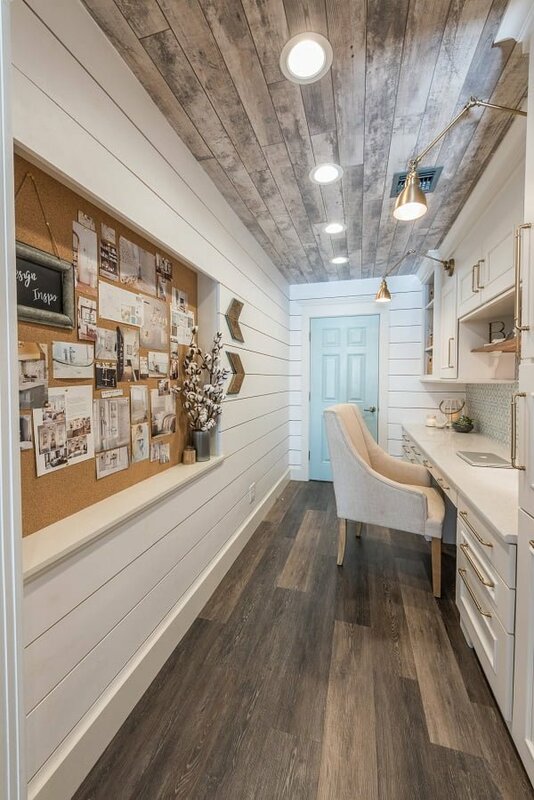 This hallway-turned-office blends white plank walls, a pale blue entrance door, and a large white desk to create a lovely and cheerful atmosphere. 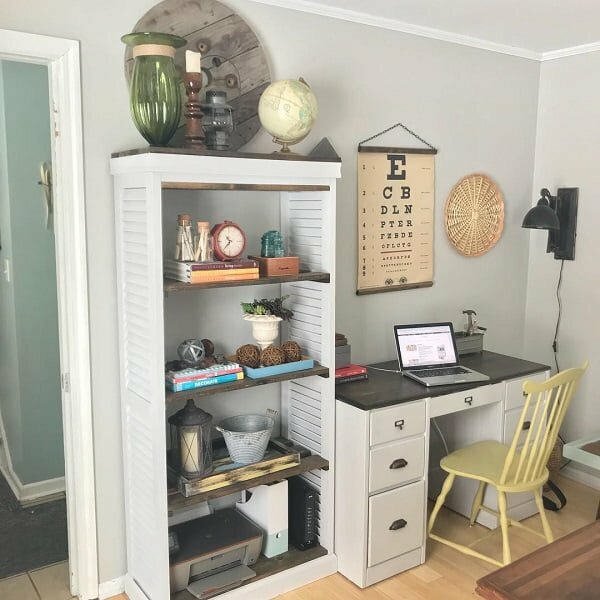 The pyramid-like white plank walls play extraordinarily with the double joint hardwood office desk and old-age stove transformed into a bookshelf and cabinet space. 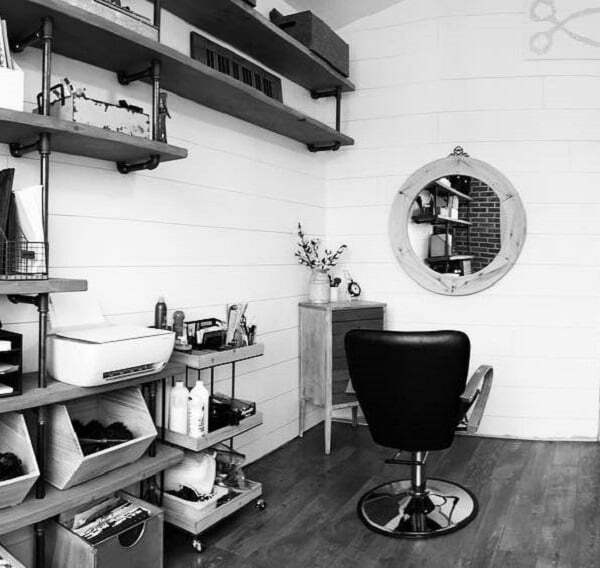 An en-suite office space using open hallways, and adorable decor elements, such as the dark countertop desk shelf and incorporated white cabinets. 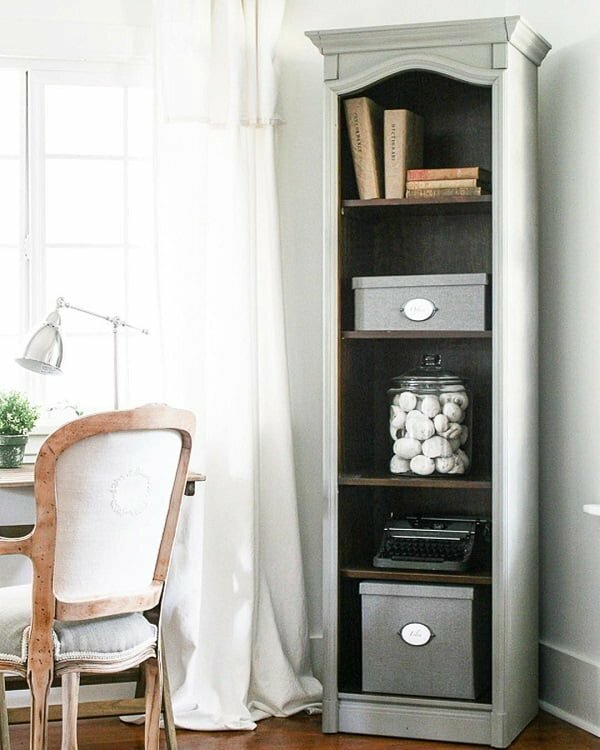 The tiny office relies on fancy elements, such as the tropical open bookcase rack and rustic white offie desk with black wood countertop. The office incorporates double bookshelf racks and black office desk and chair. To make the room pop, the designer used Arabic-inspired carpet and retro bamboo storage box. 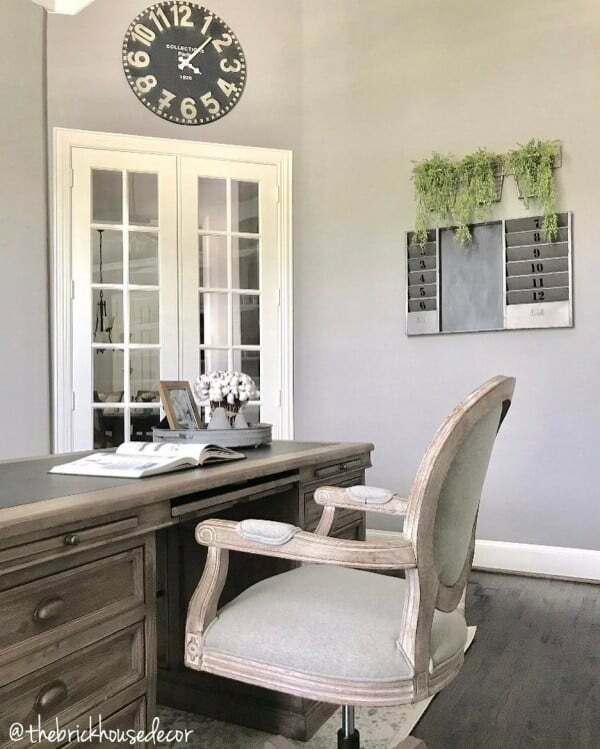 The shiplap white walls offer light and spaciousness into the office, while the Victorian chair and tin shelf stand captivate a fantastic and pleasant vibe! 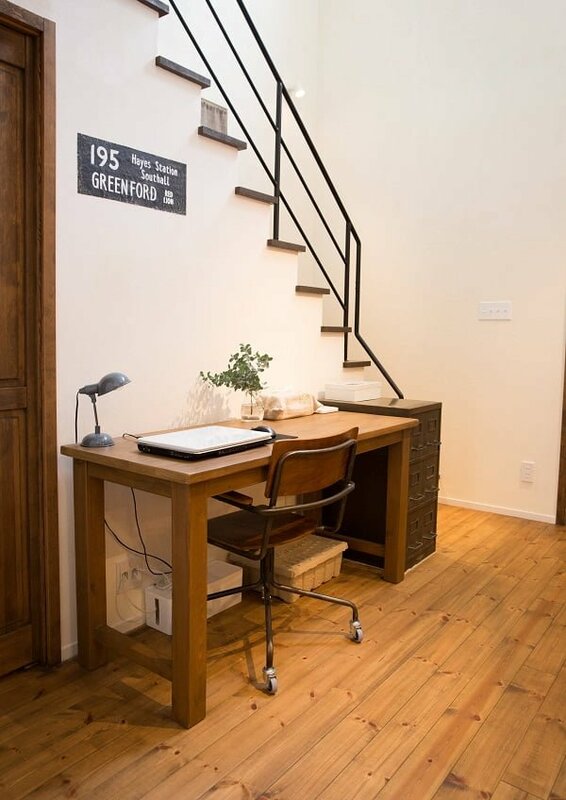 This secluded office is positioned behind the set of stairs and focuses on bright wall wood details and a single standing vintage nightlamp. 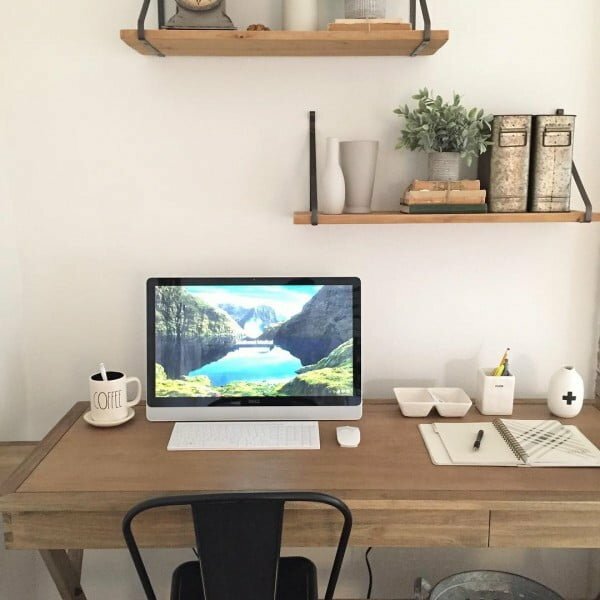 The wooden countertop serves as a work desk and is complemented by a strategically placed set of wood shelves and two trendy office chairs. 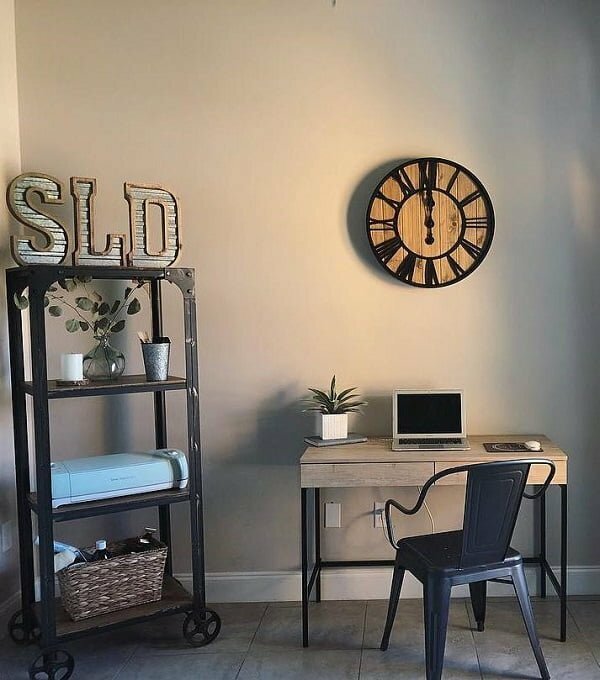 The statement red brick wall of the office emphasizes the fashionable framed sign, while the single white wood desk allows practicality and comfort at the same time. 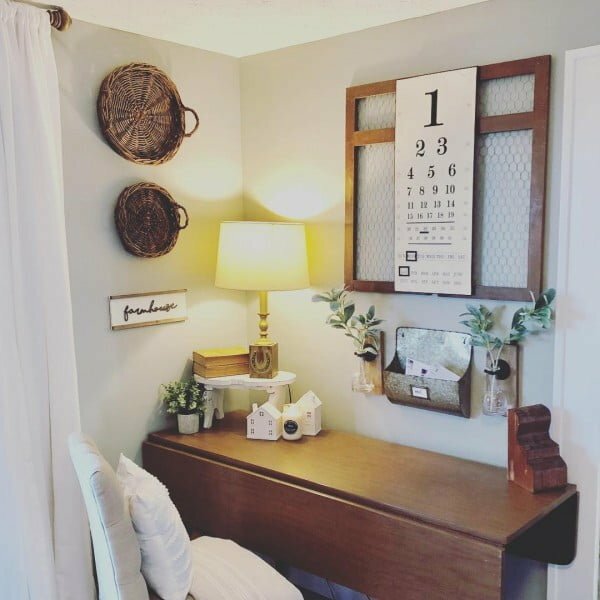 This office is a pure heaven for people enjoying simple details like the transparent task board and the single dark wood desk. 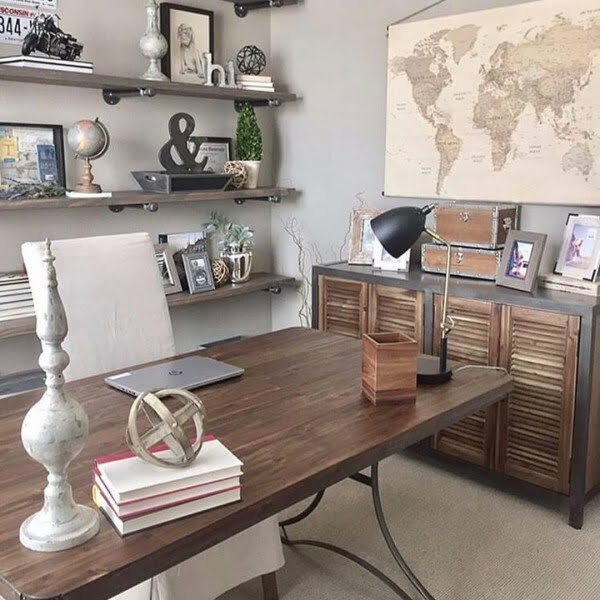 The wood-on-wood play between the single office desk, the double shelf wall set and storage cabinet allow this office space to explode with style and adaptability. 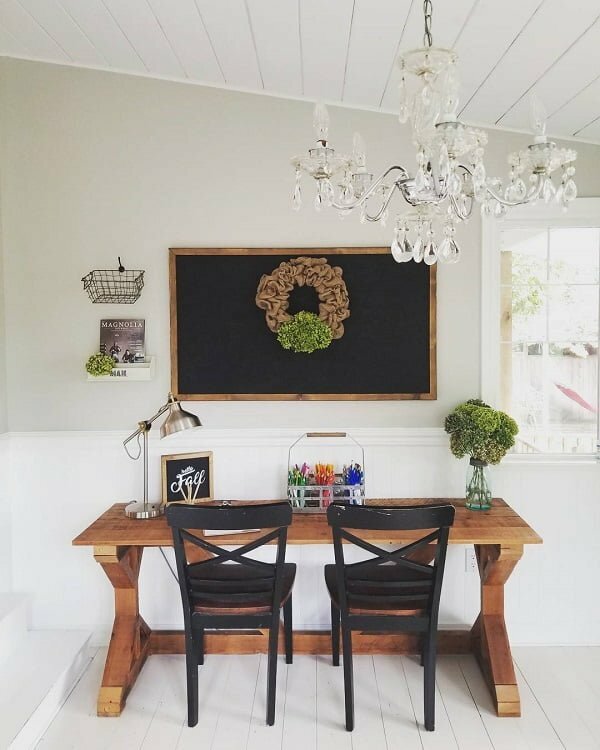 If you are wondering what to do with your white walls, how about making a hanging book pages string and installing a dark wood plank segment on the walls? 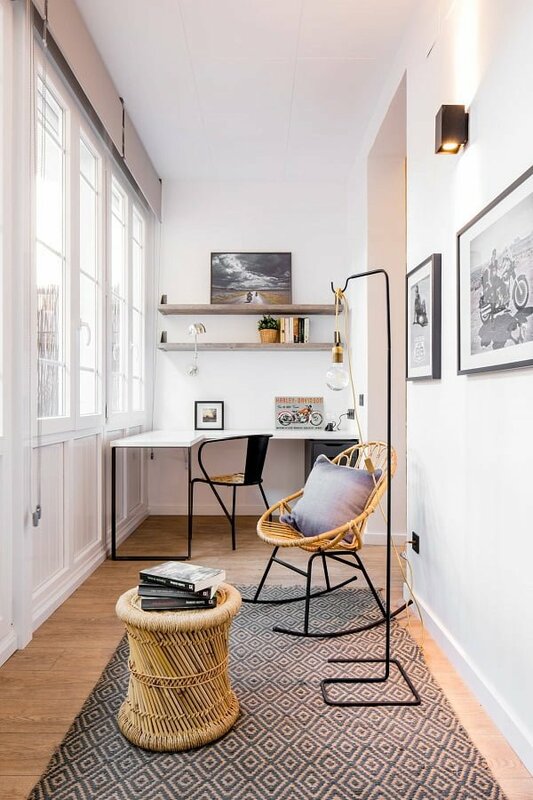 The stunning and attention-grabbing piece of this office is the parquet-inspired desk countertop which matches well with the all-white walls and dark wood window closure. 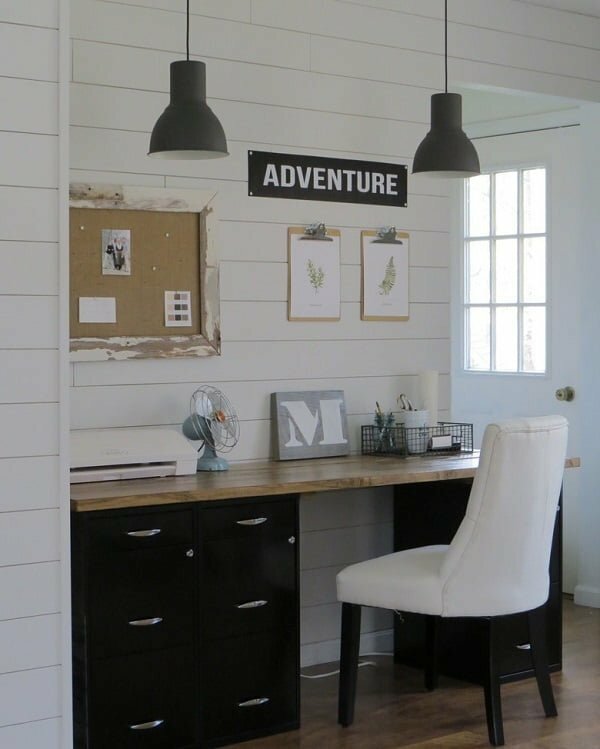 From the statement wall sign to the hanging cork board and black wood office desk, this space marvelously defines balance and serenity at the same time. 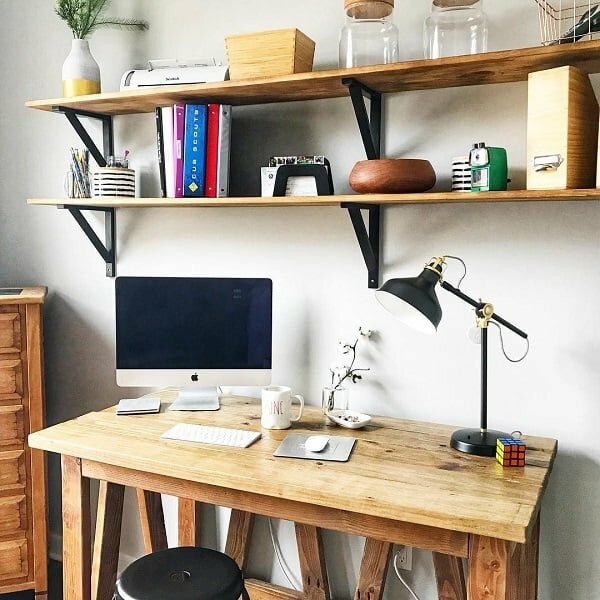 The warm tones of this office are mostly focused on the staggering handmade table-desk and bamboo-wood shelf rack, creating a nostalgic comfort. The retro single piece shelf rack is adding to the office’s comfort, while the exposed window introduces light and revealing the palace-inspired chair. 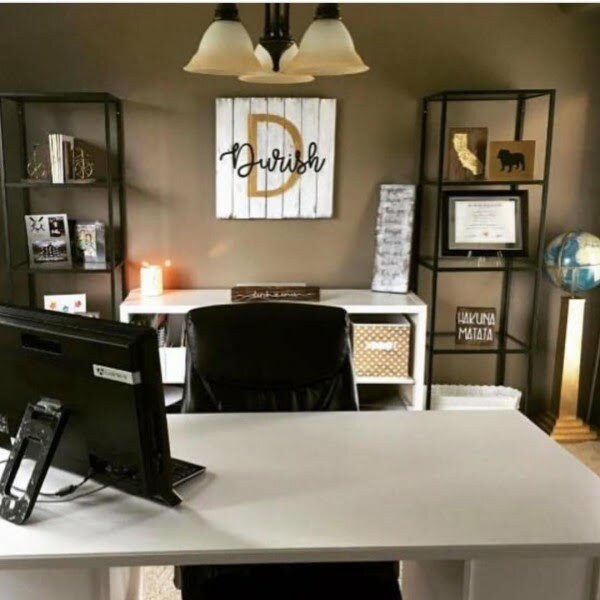 A centrally placed office with staggering wood desk, black set of chairs and hanging wallboard, all intertwined into a delightful design perfection. 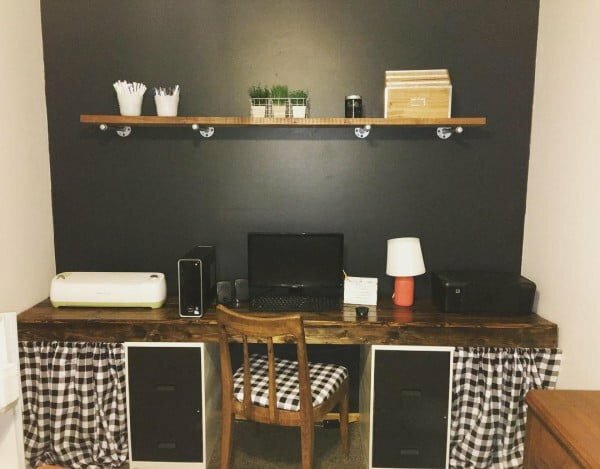 The divine black wood office desk works its magic around the wood shelf set and under-desk storage drawer. 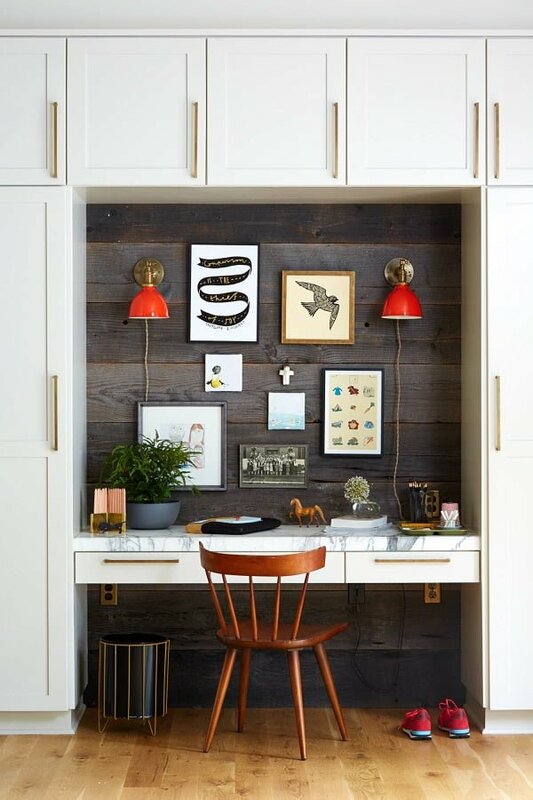 The frame wall collage is a captivating segment of this office, which also has the dark hardwood desk and a retro alarm clock to create warmth in the space. 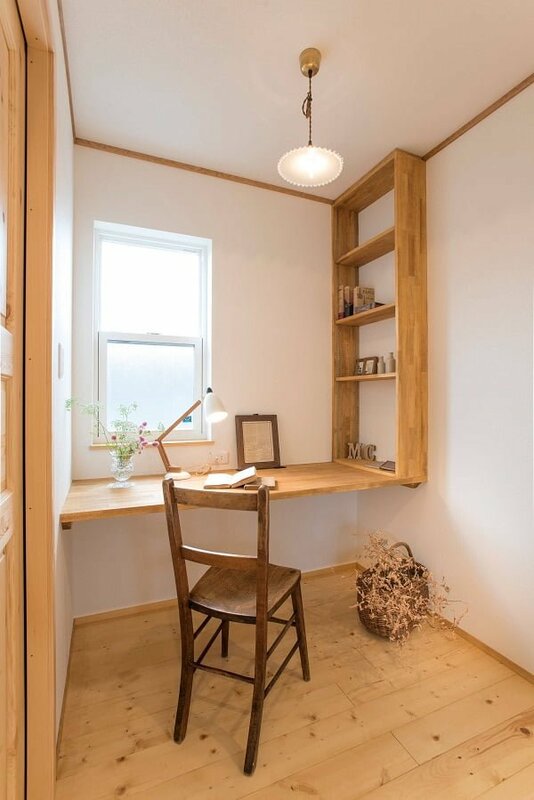 This guest house inspired office is all about wooden walls and floors, sophisticated office chair and incorporated wall cabinets. The intelligent and creative taste for design in this office is seen through the pastel green and blue hanging cabinets, the shelf-like desk, and the retro wired telephone. 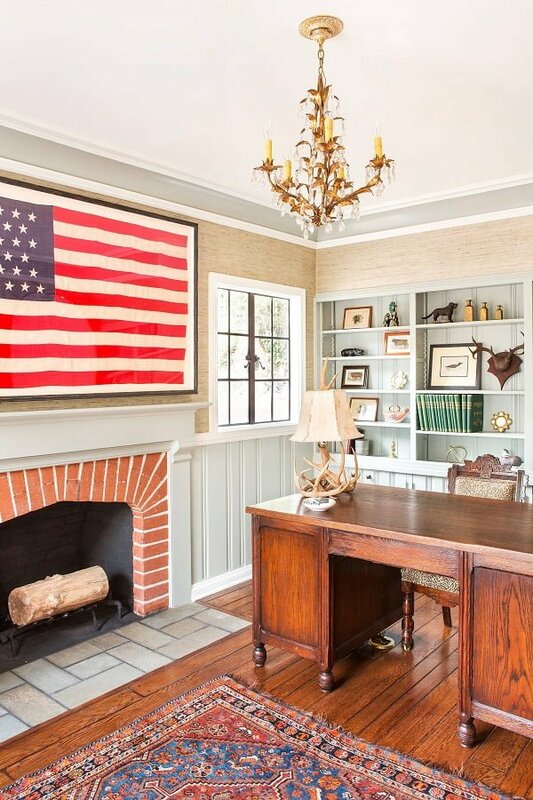 The spectacular framed American flag gives this office an emotional feel, fabulously mixed with the presidential-like desk and open brick fireplace. Without wanting to strictly feel as, on office, this design is creating an artistic vibe using hip wallpaper and a minimalistic shelves rack. 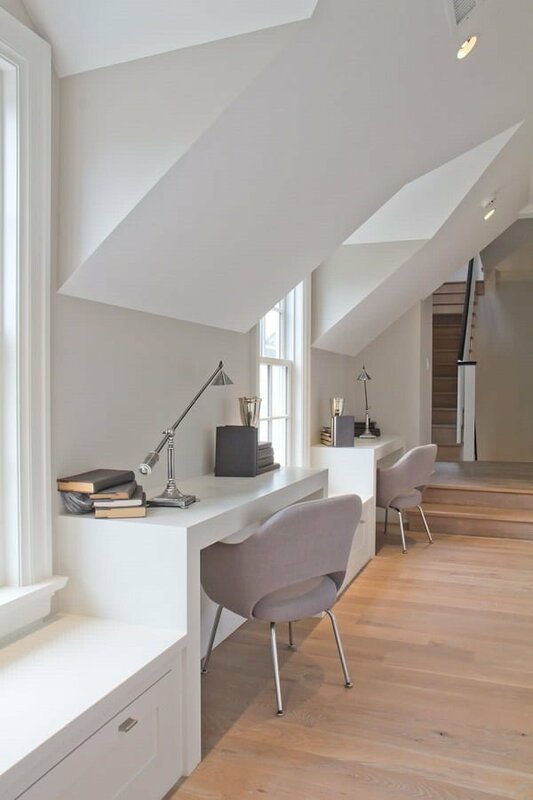 The under-staircase office uses the open space well by introducing a compact file storage cabinet and freestanding wood office desk. 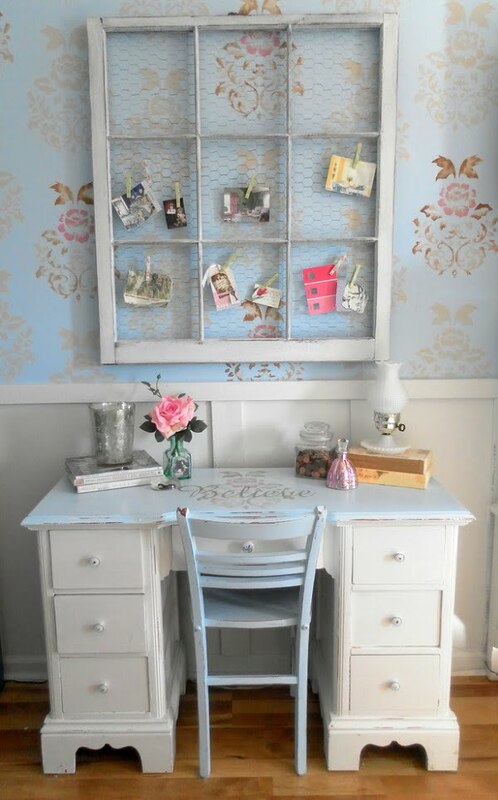 The pastel color scheme is a great match for the dreamy retro office desk and white vintage gas decorative lamp. Effective and charismatic! 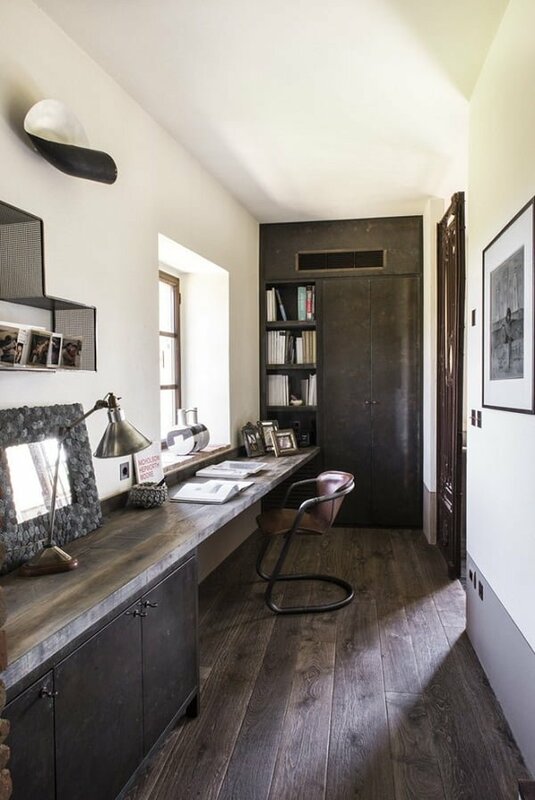 The sky-high walls are decorated with white wood planks, which illuminate the minimalistic black office desk and blush leather chair magnificently. A fine design collage blending different-era patterns, such as the middle-age iron chandelier and animalistic carpet and decor pieces. 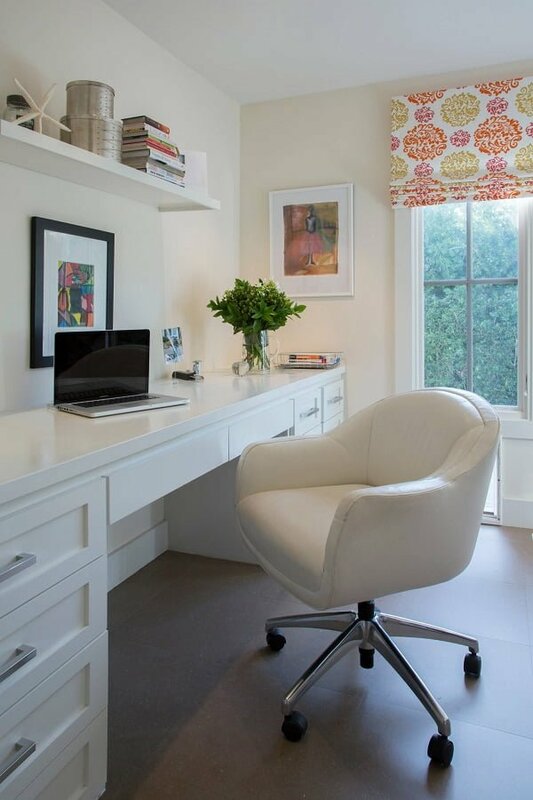 The white-red office chair design makes a good addition to the parquet-laminate floors and hanging green decorations. 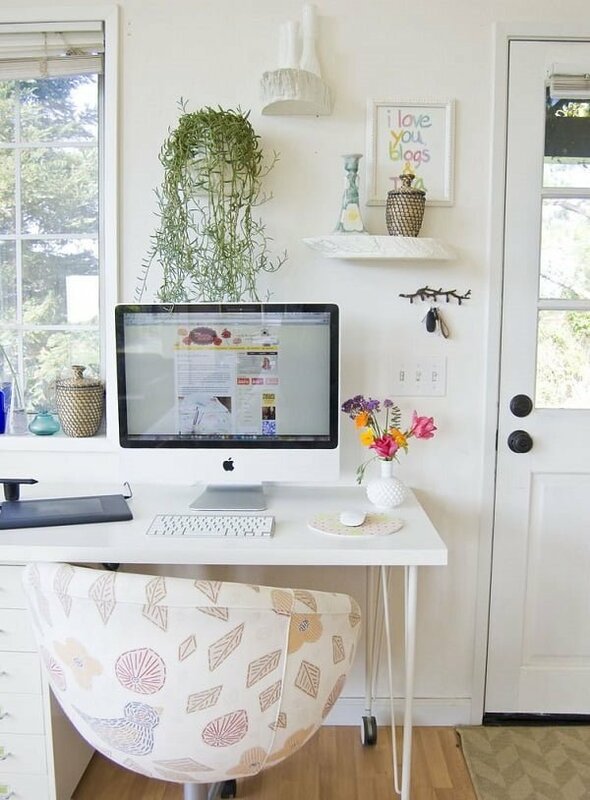 From the rounded glass office desk to the multiple slanted windows and medium wood door, this office screams of chicness and work mode all at once. 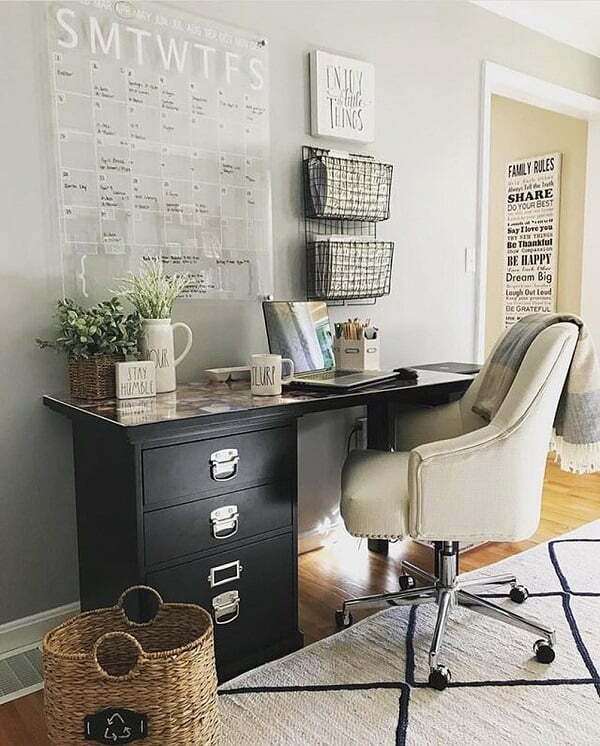 To learn the feel of this space, focus your attention on the metal support pieces, incorporated in the retro rocking chair, tall night lamp and fancy office chair. 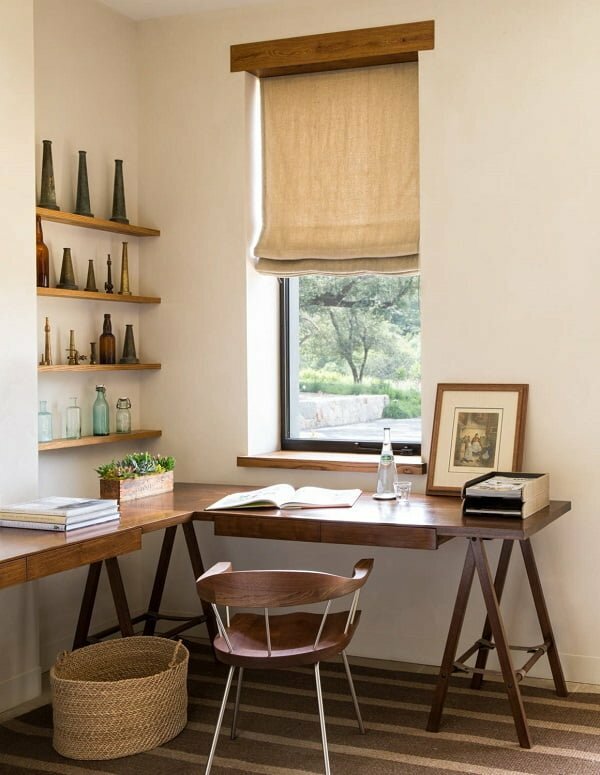 The connected shelf-like desk and vertical shelf rack leave plenty of room in the office to accentuate the retro handmade wood chair and fantastic outside window.